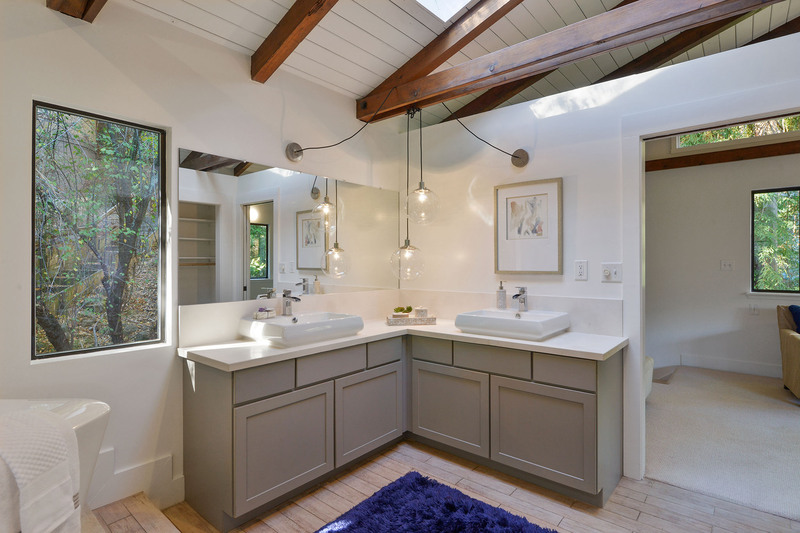 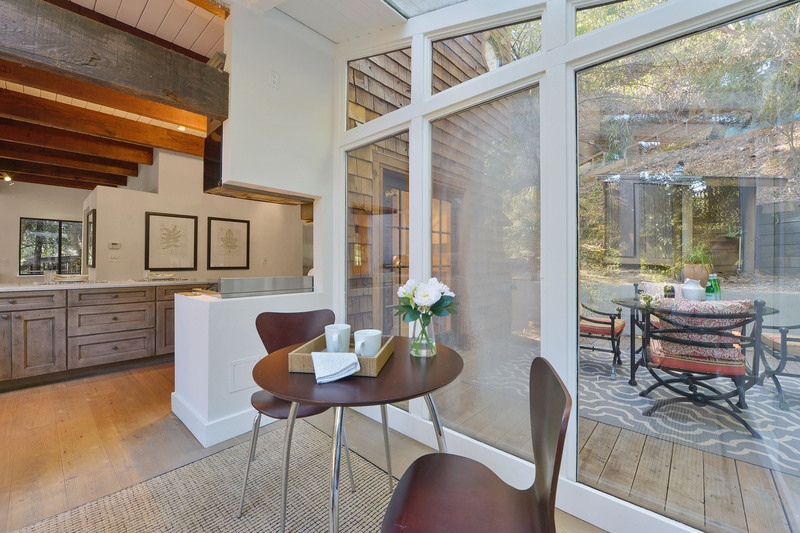 With a craftsman cedar-shingled exterior and interior cathedral of simple, open white space speared by 12x12 wood hand-hewn beams; you’ll walk into a rare juxtaposition of NYC loft meets forest retreat. 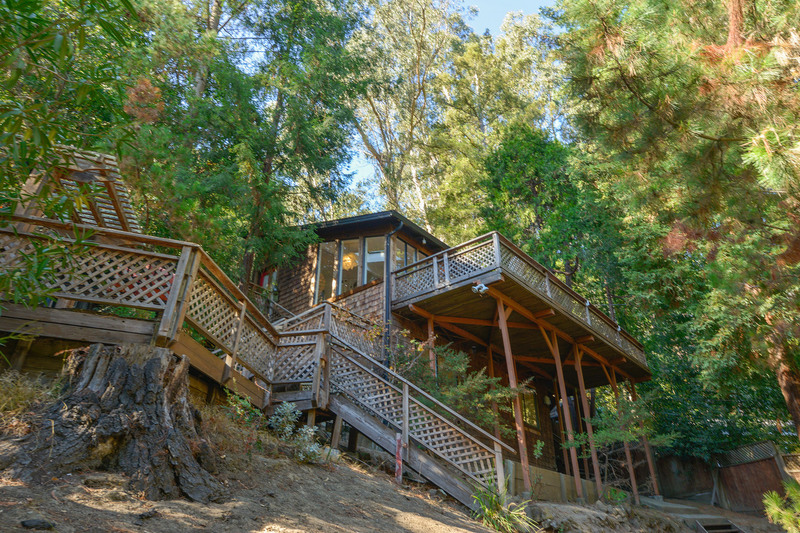 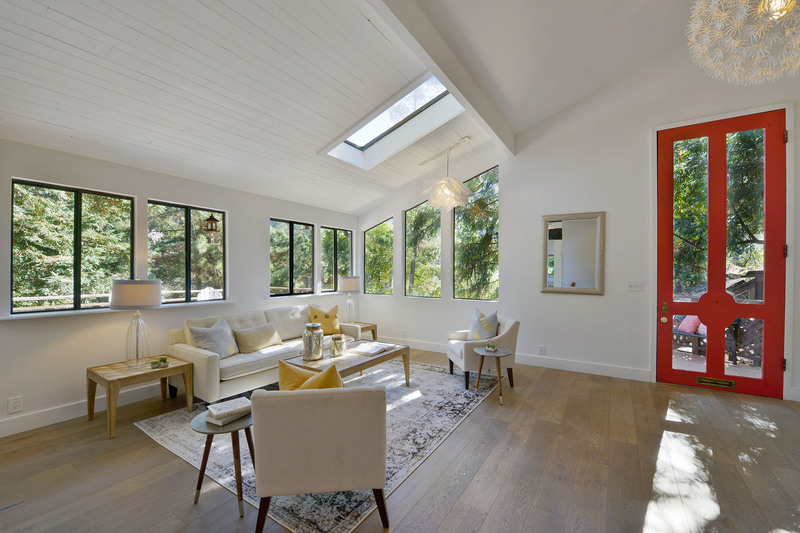 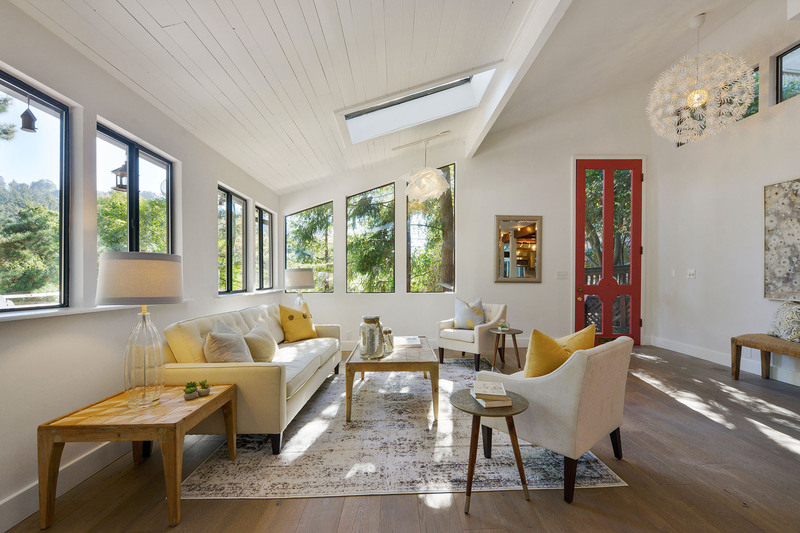 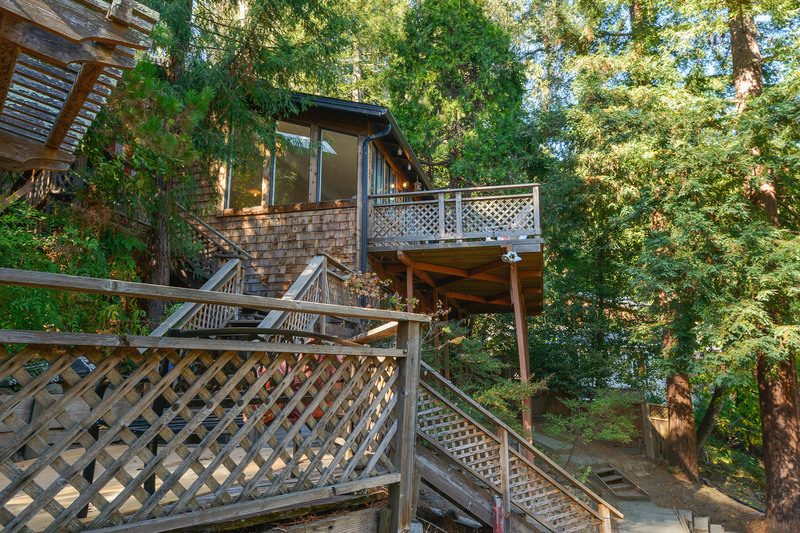 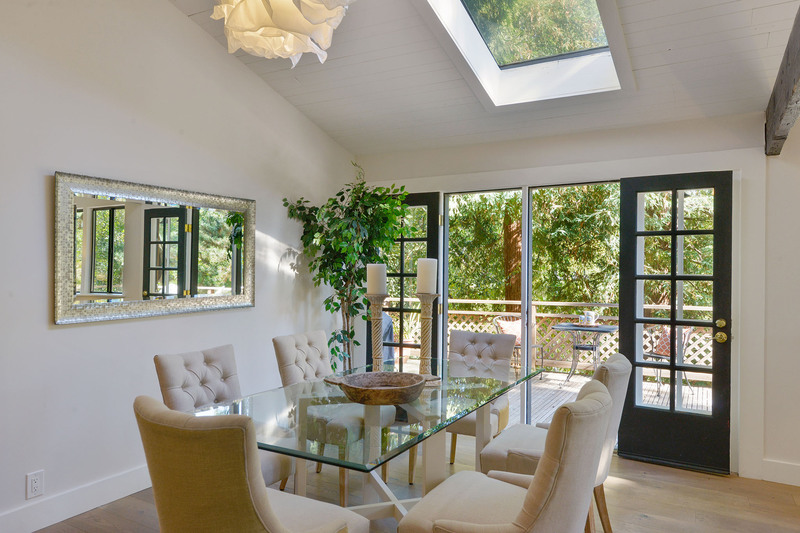 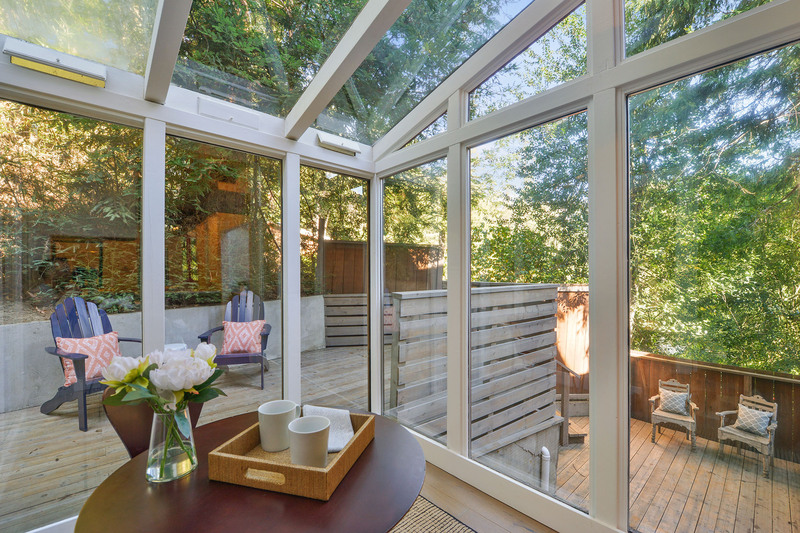 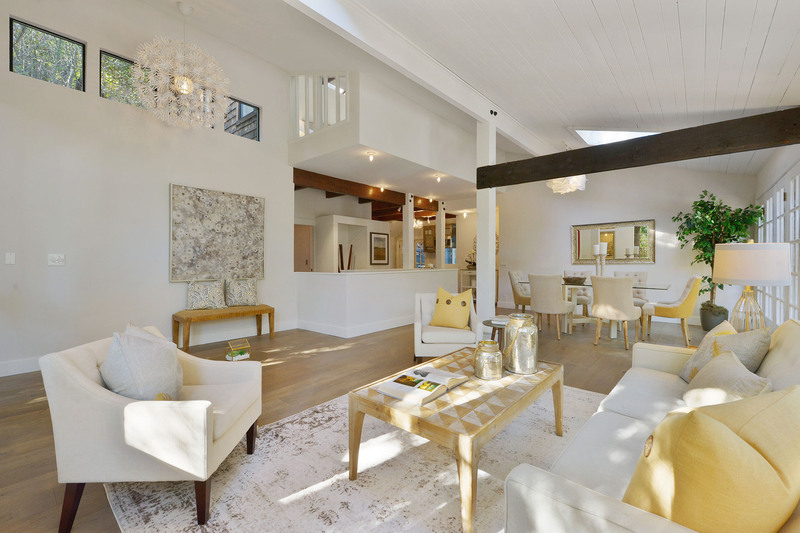 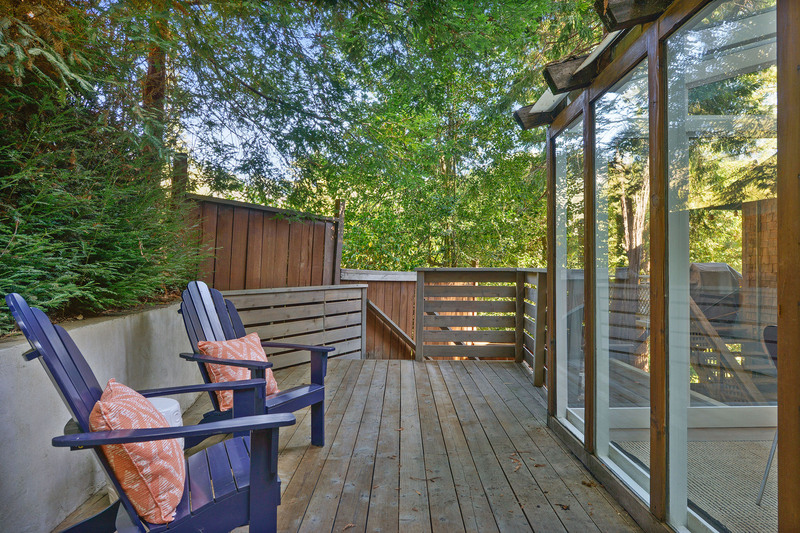 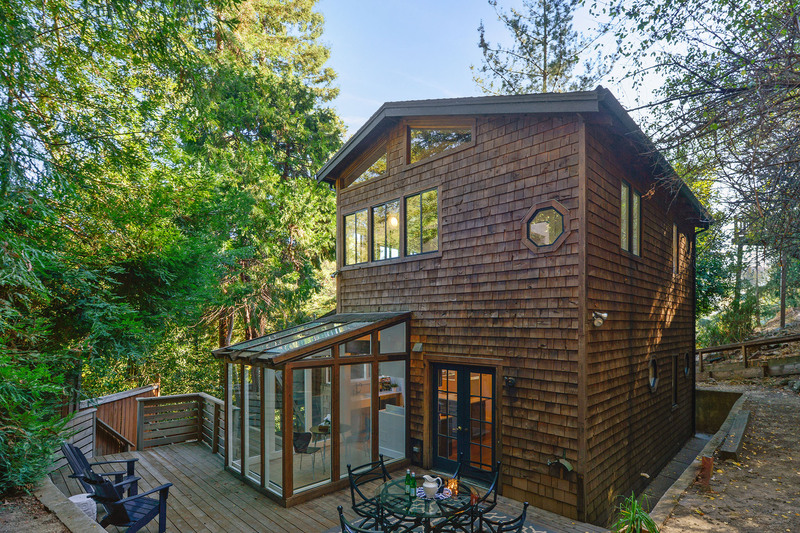 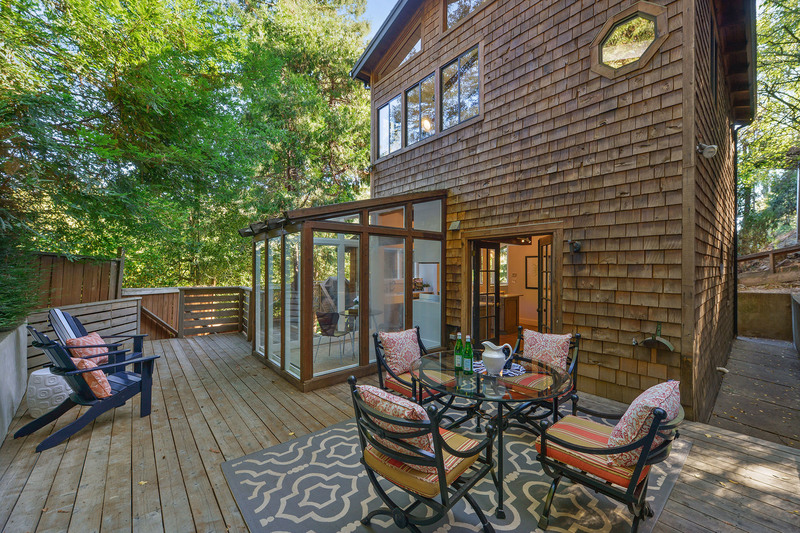 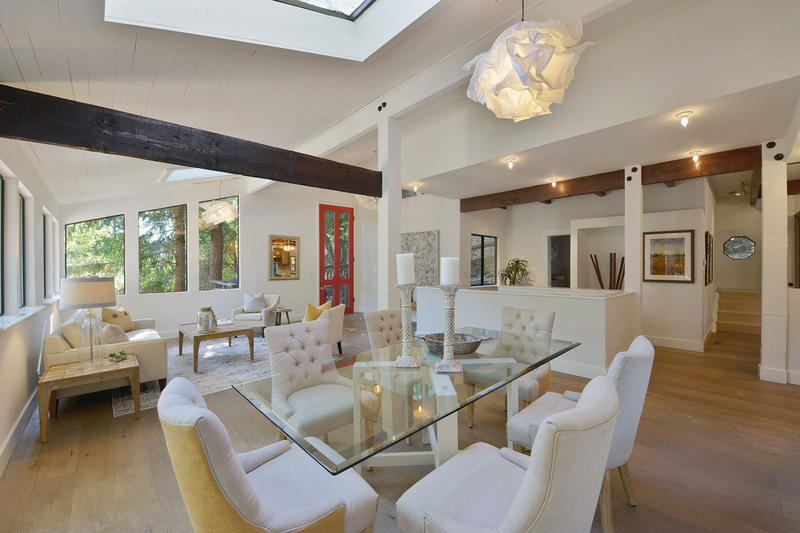 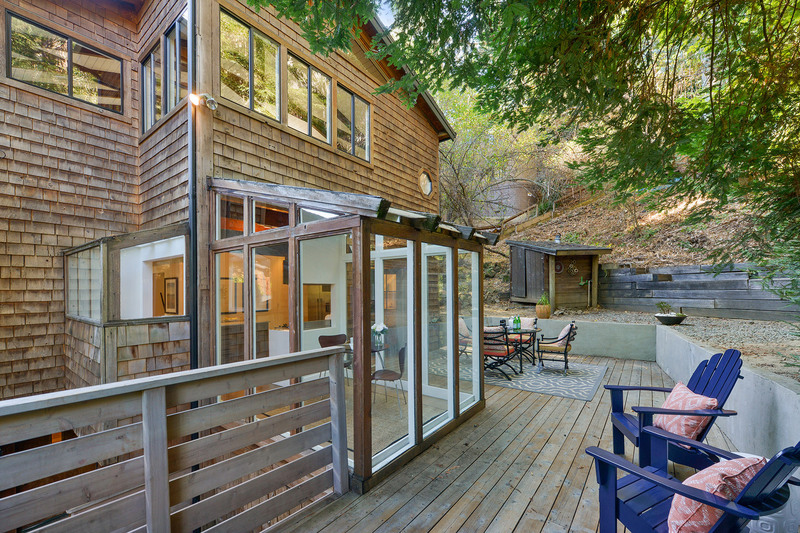 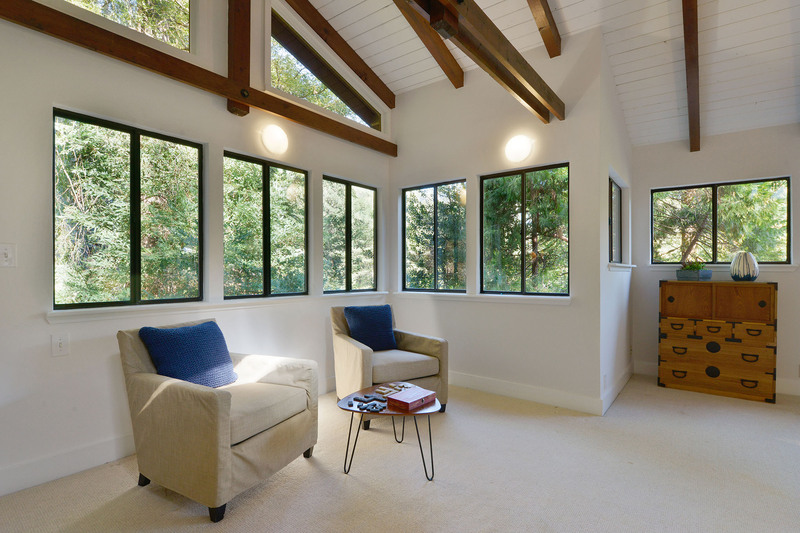 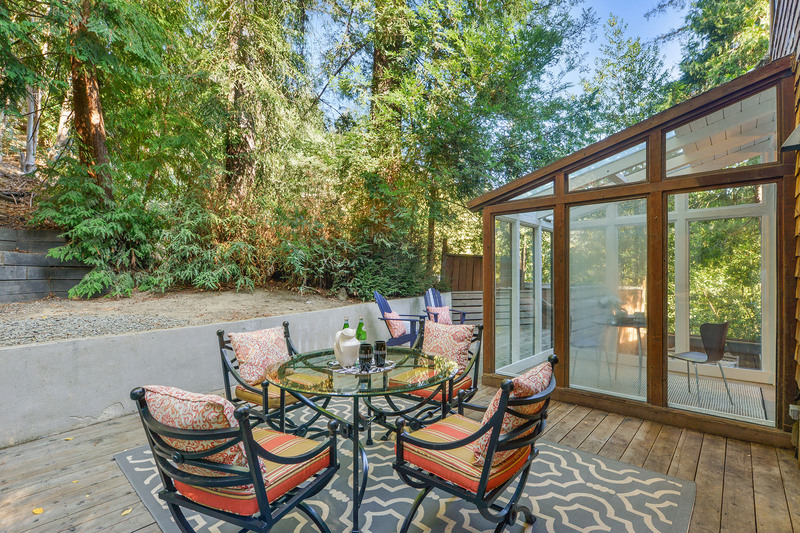 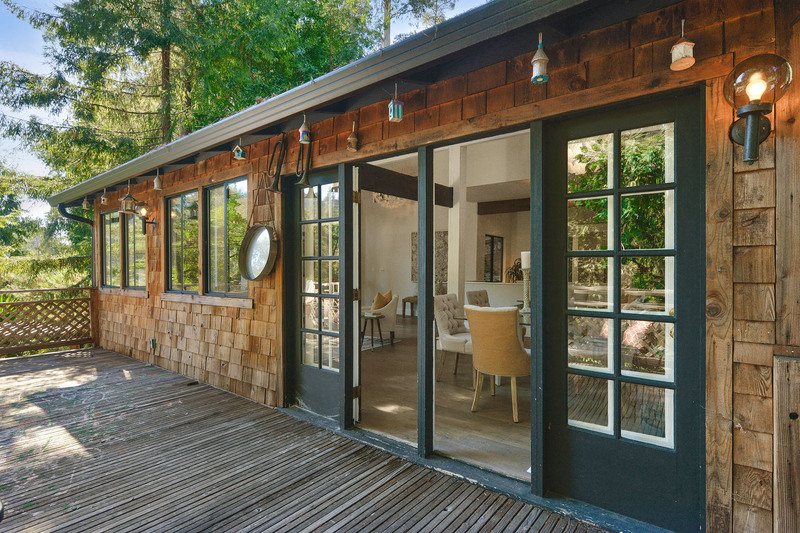 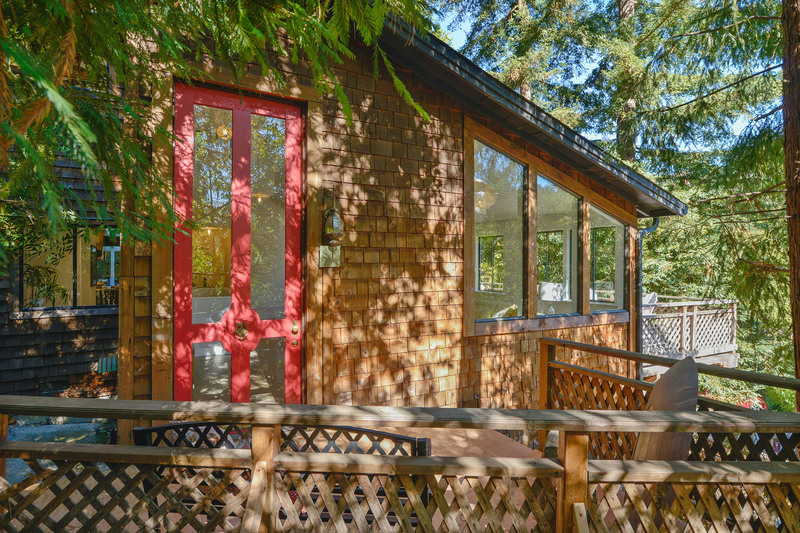 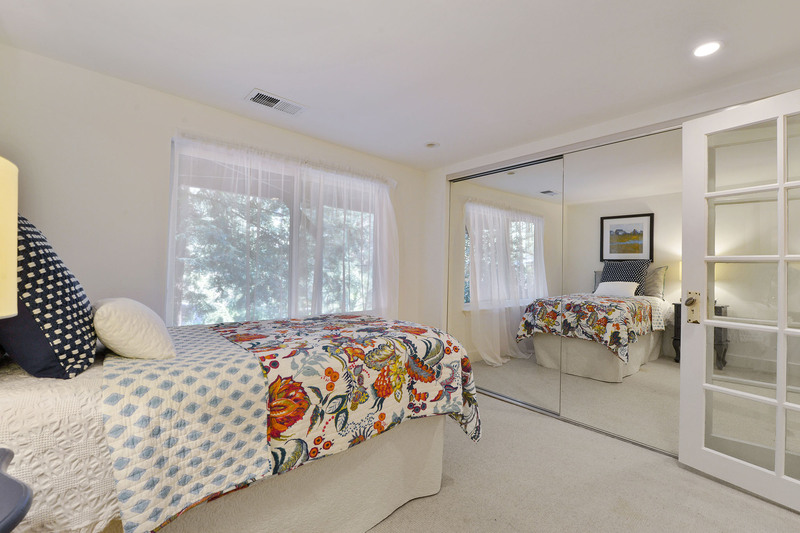 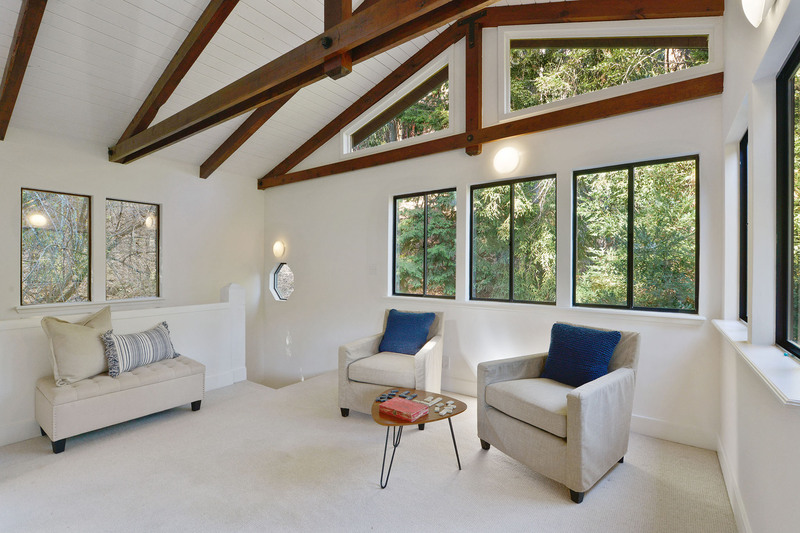 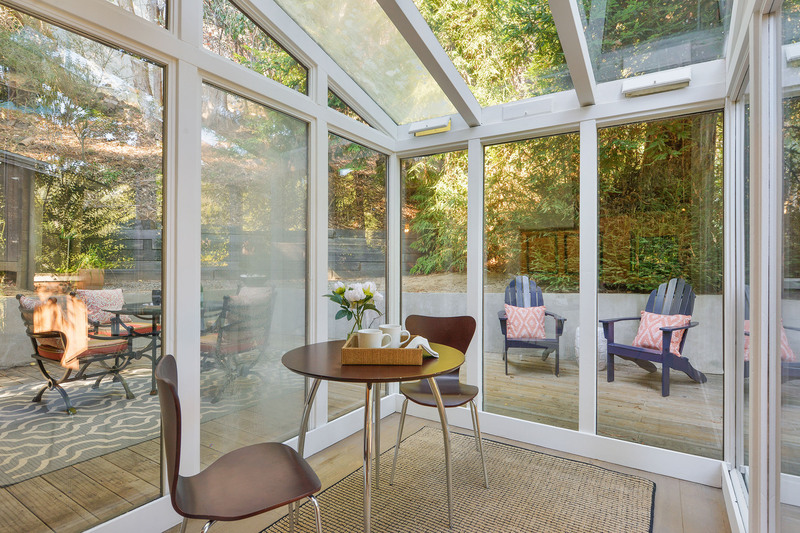 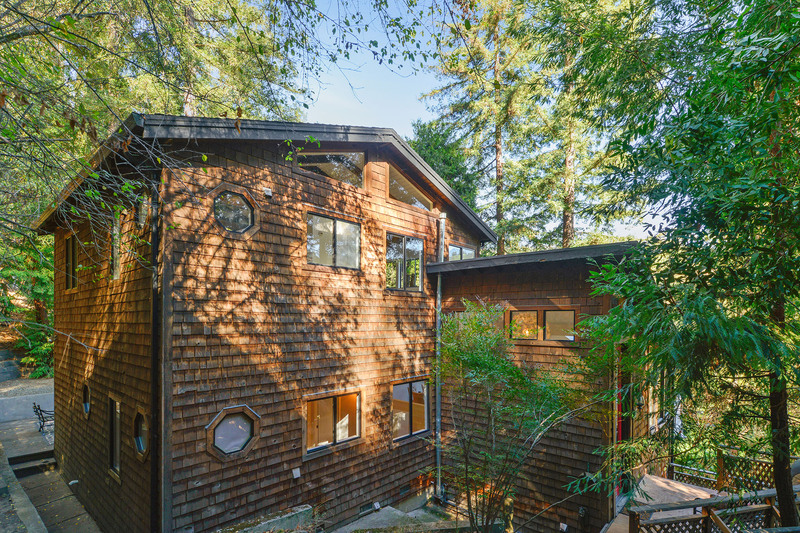 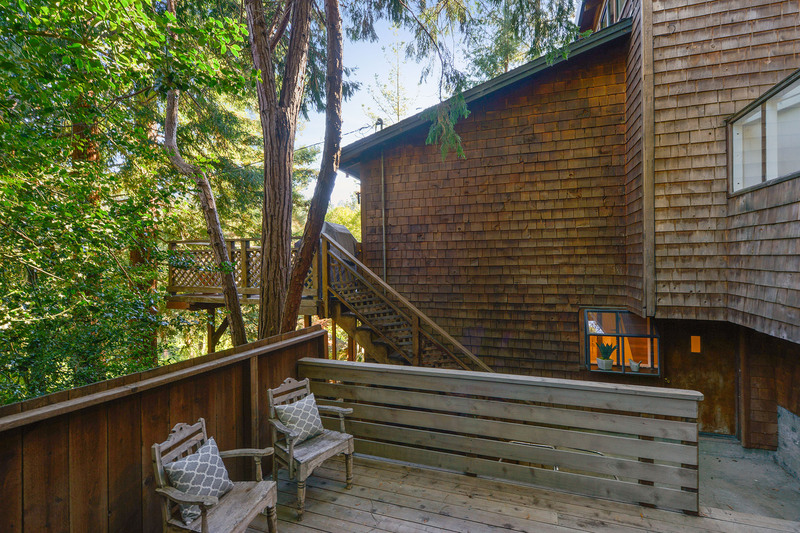 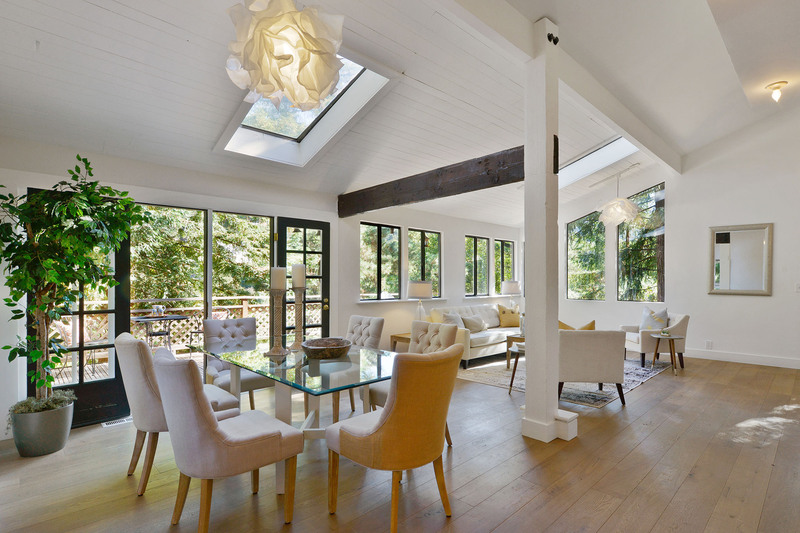 Total privacy encapsulates this home lifted above the street and surrounded by redwoods. 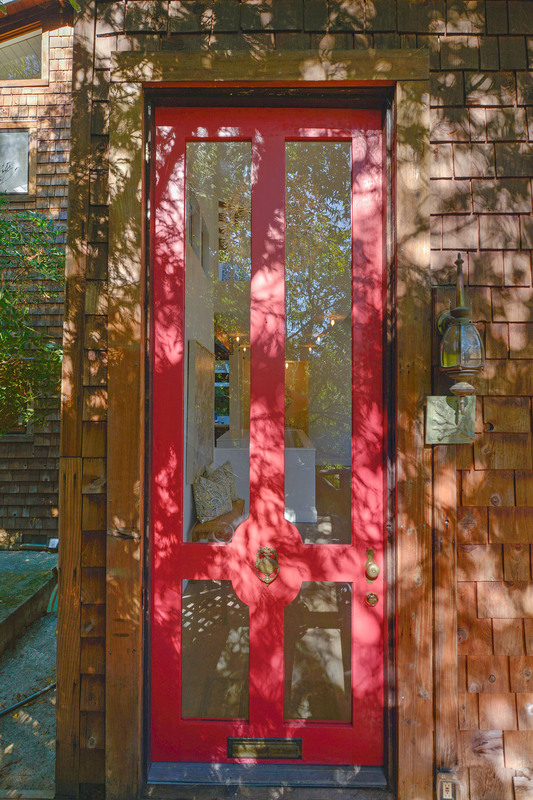 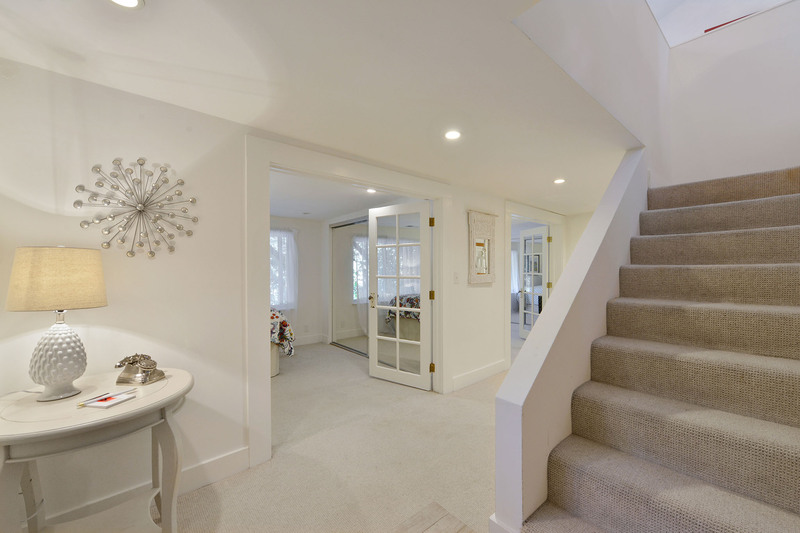 The house welcomes you with a massive 12 foot front door opening onto grey Belgium wood floors. 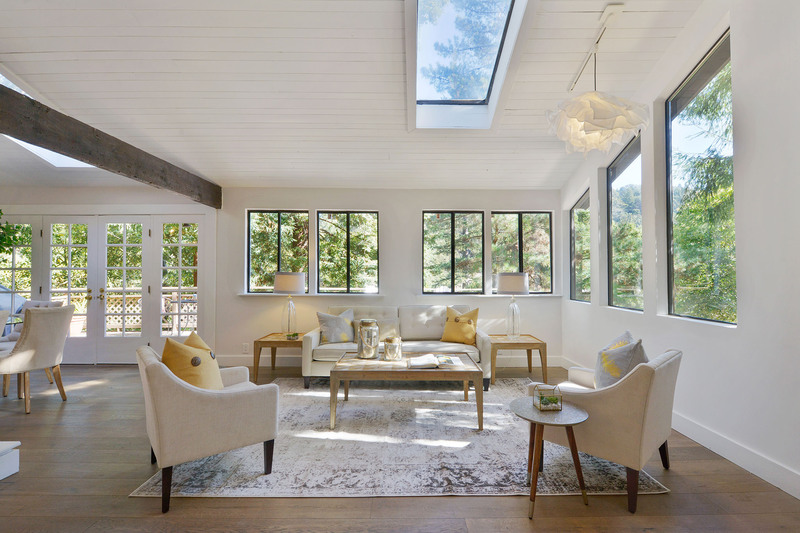 Designed to inspire creativity, by a fashion designer as her oasis from NYC, the open floor plan has soaring ceilings and expansive outdoor views. 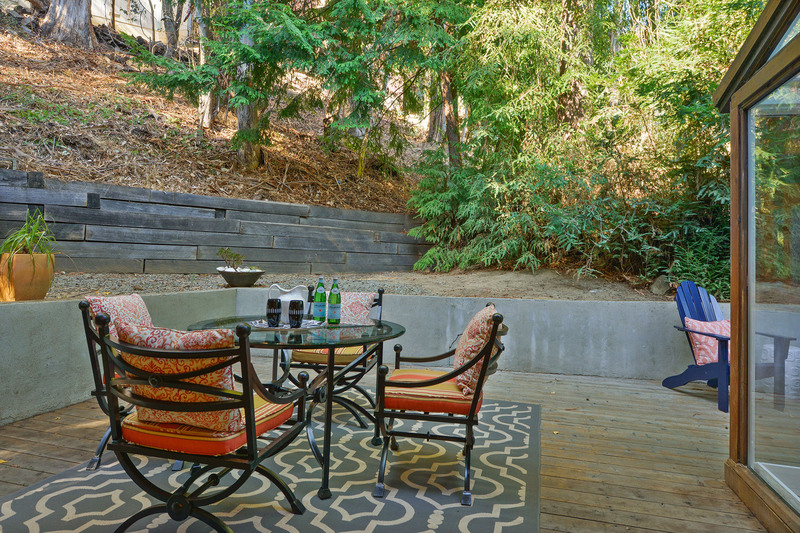 Nature will lull you to a place of calm! 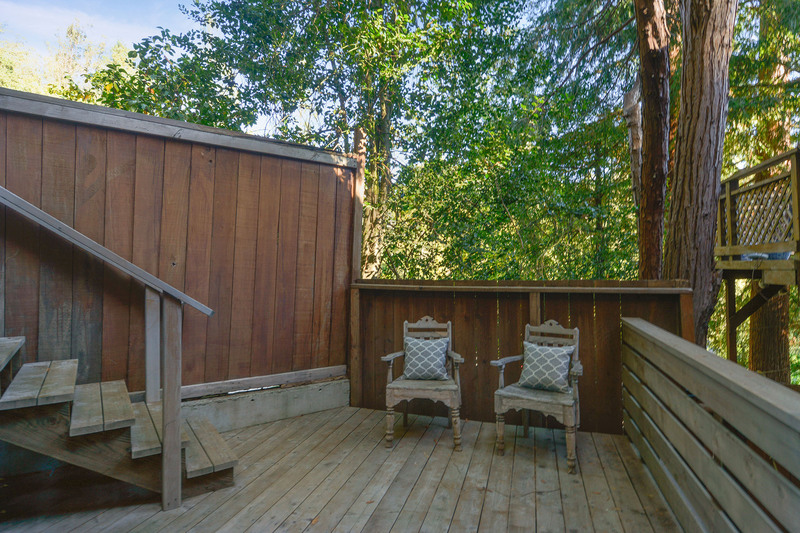 The many decks surrounding the house provide serenity and the ideal flow for entertaining both indoors and out. 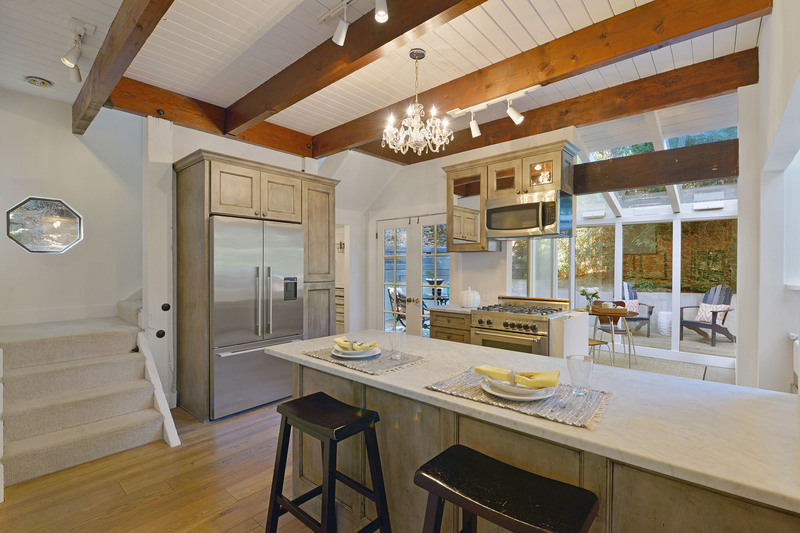 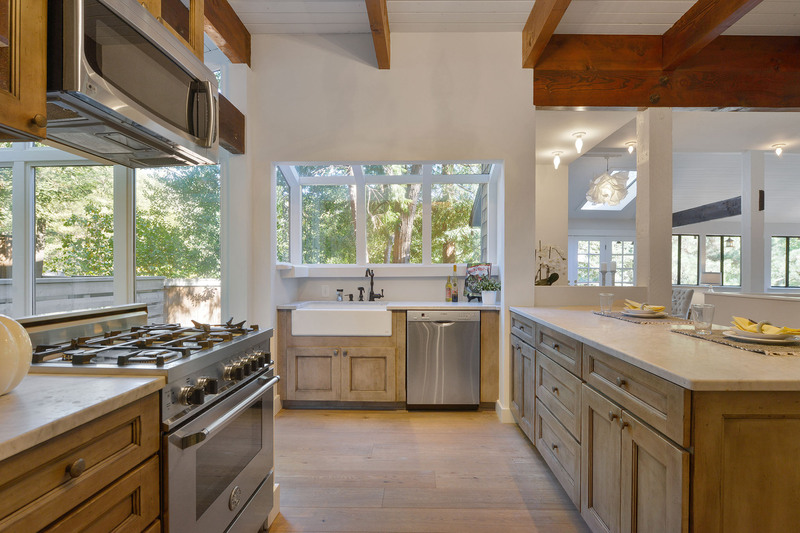 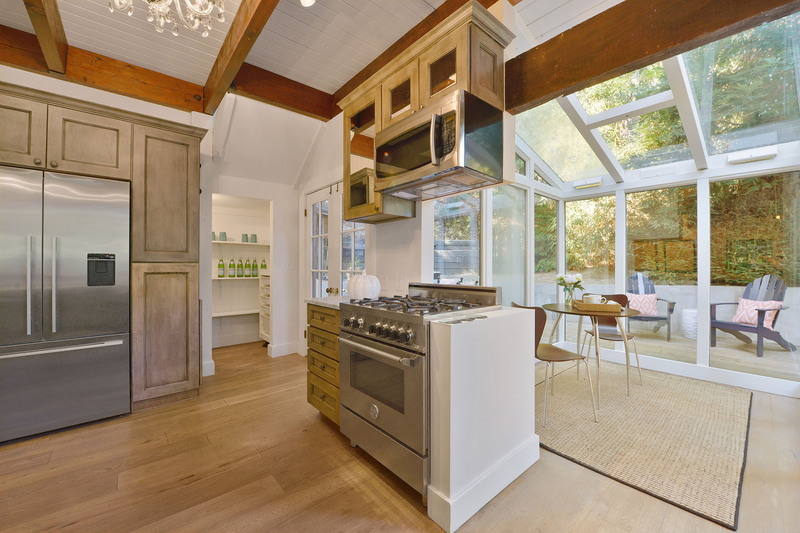 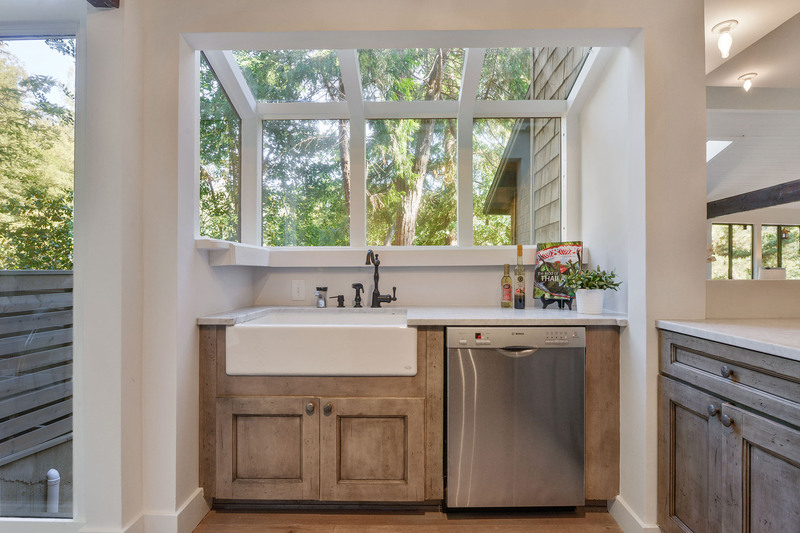 The cooks kitchen and glass walled sunroom capture the morning light and feature high end appliances with carrara marble counters. 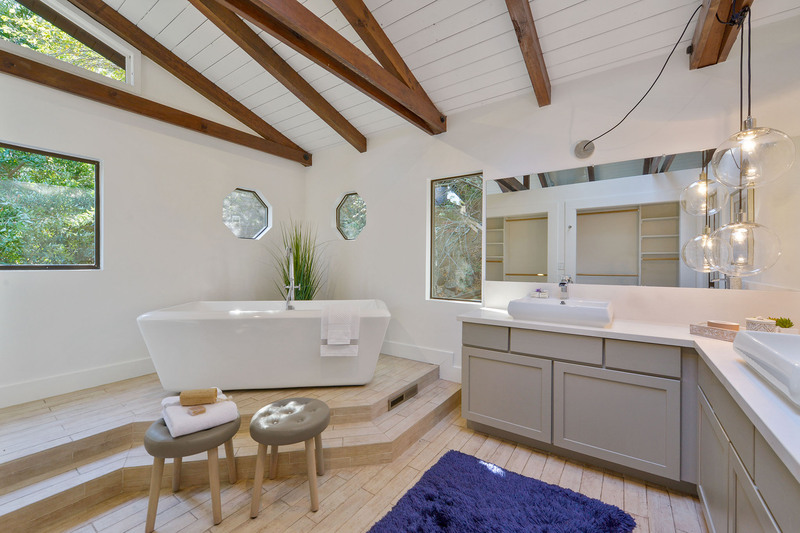 Two bathrooms are lined with French limestone, one with a glass walled shower, the other features a vintage restored cast iron tub. 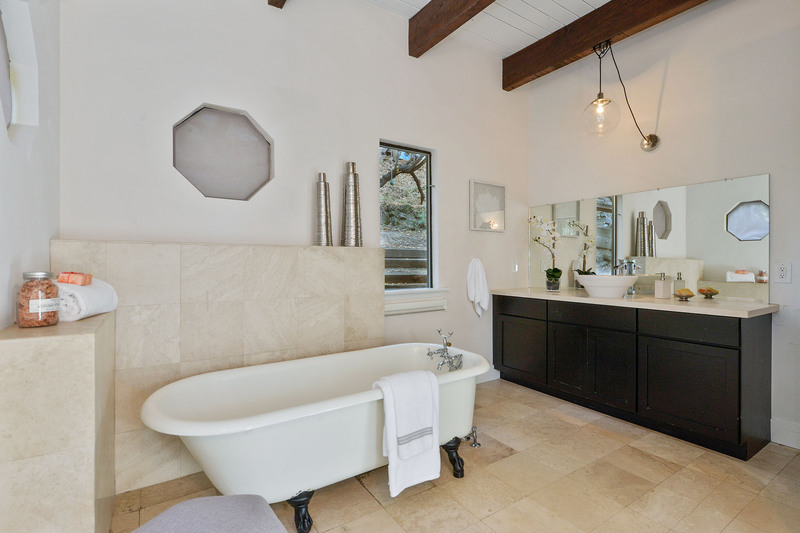 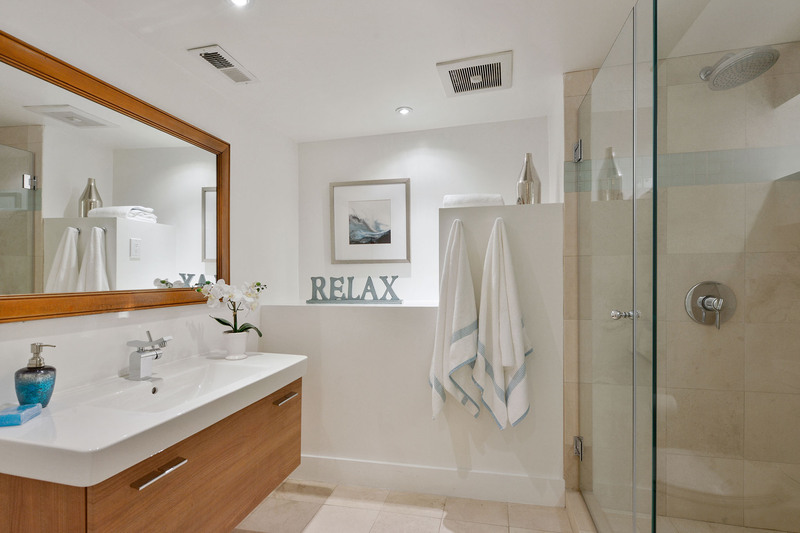 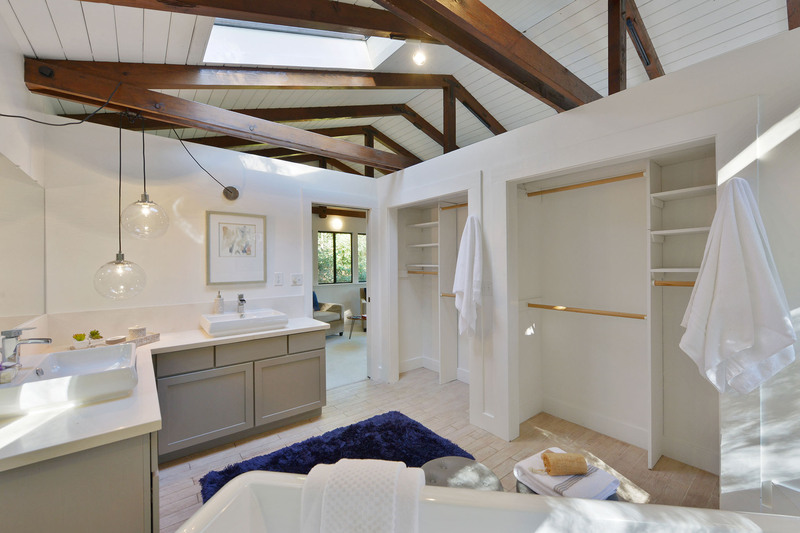 The master bath is paved with Italian wood tile and features a tub for two- creating a private spa. 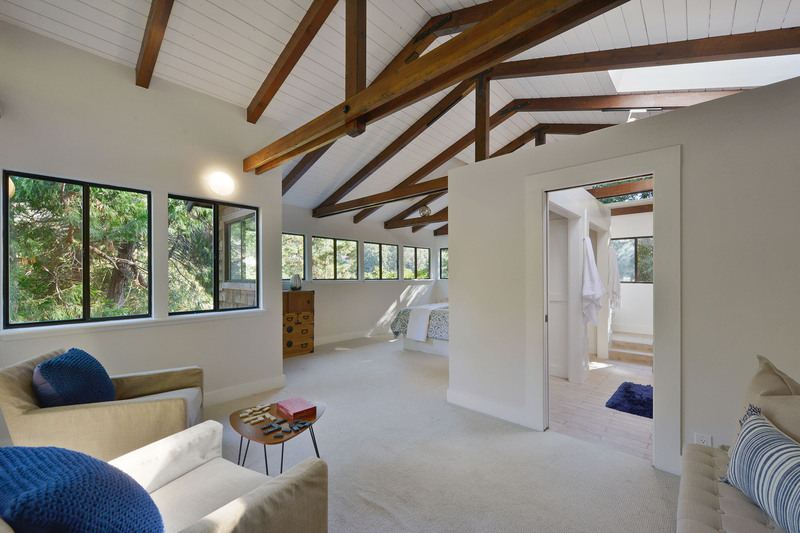 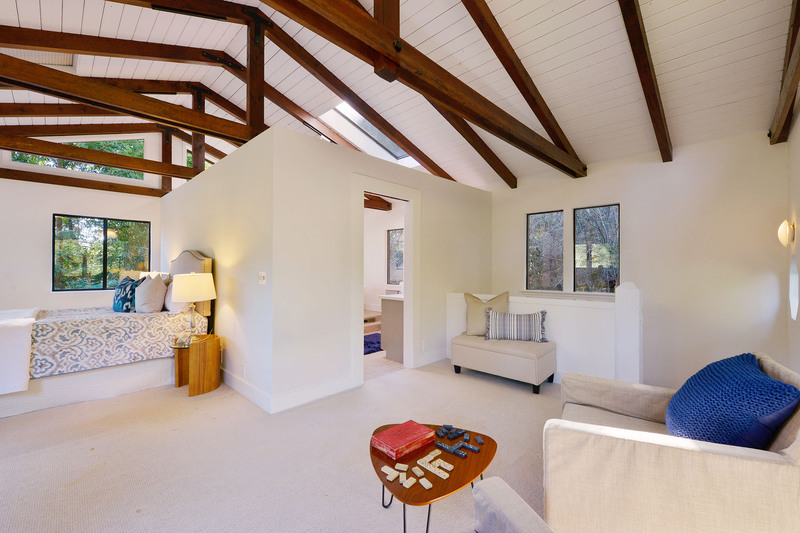 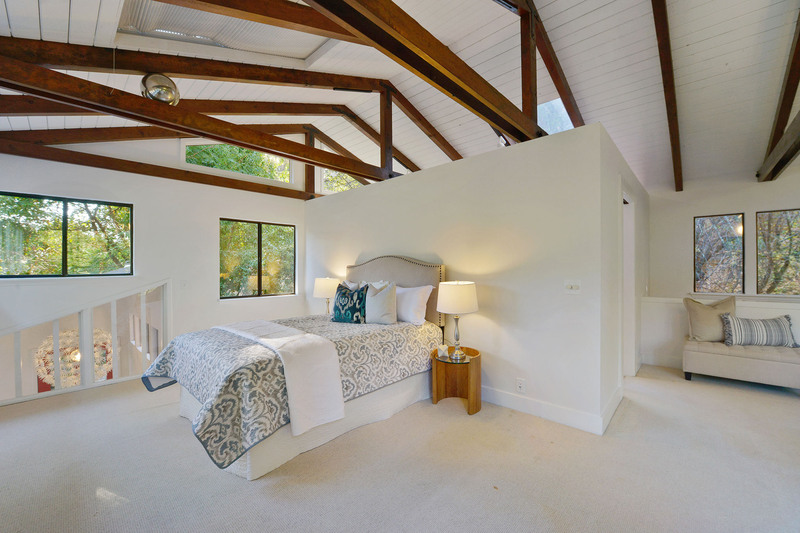 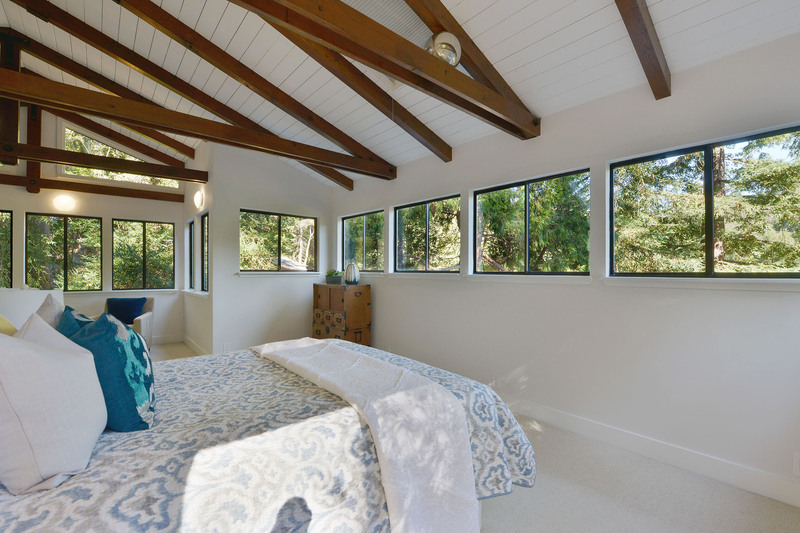 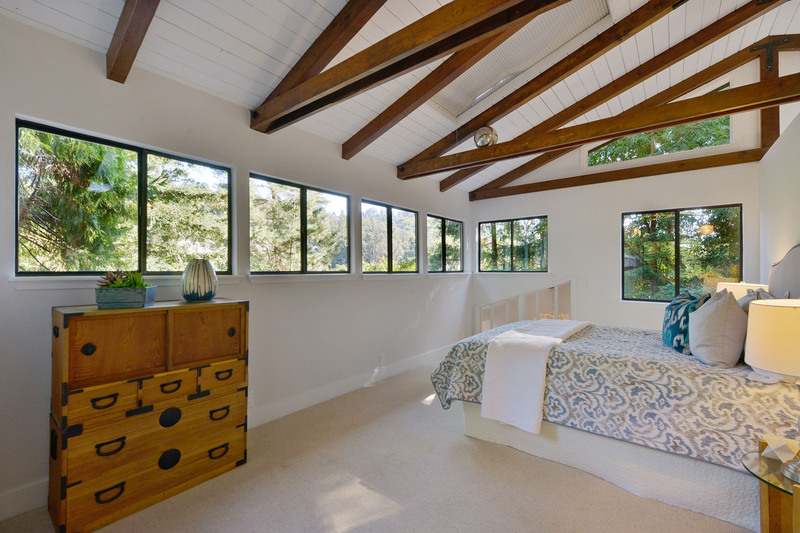 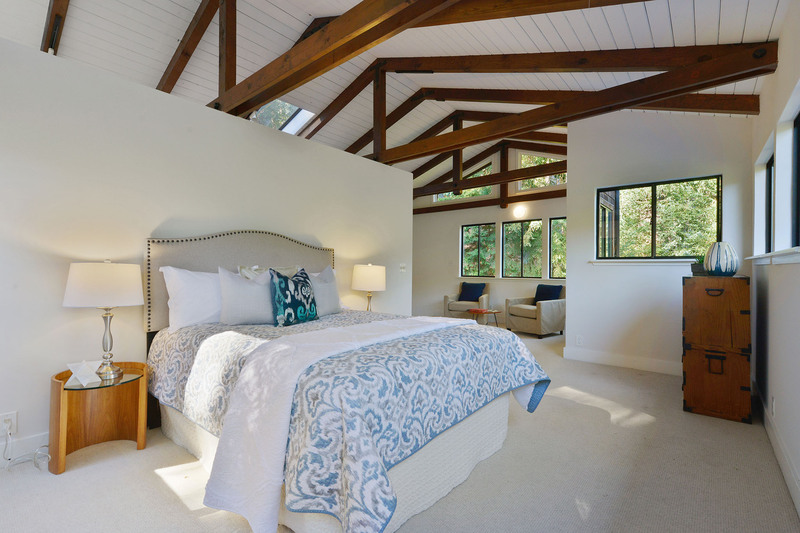 The spacious master suite is a tranquil escape, with vaulted open ceiling and walls of windows, the ultimate feeling of living in the trees. 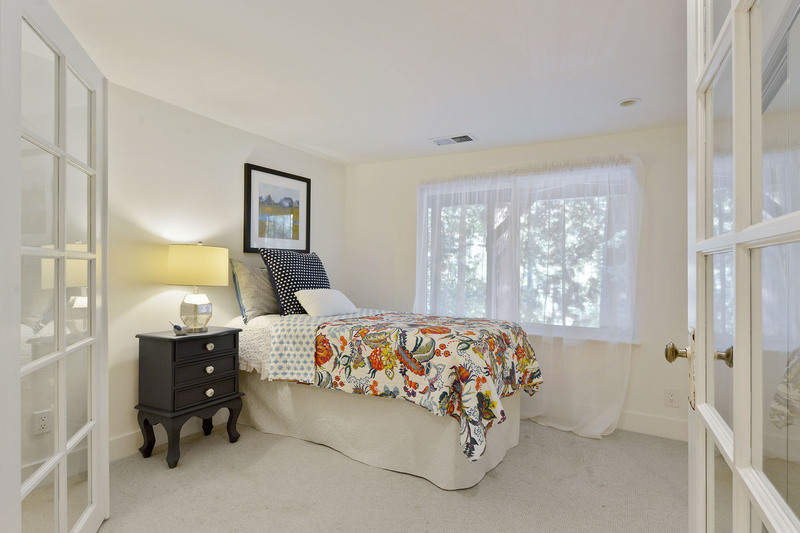 Located on a quiet cul-de-sac near highly rated schools, Montclair Village & minutes to coffee. 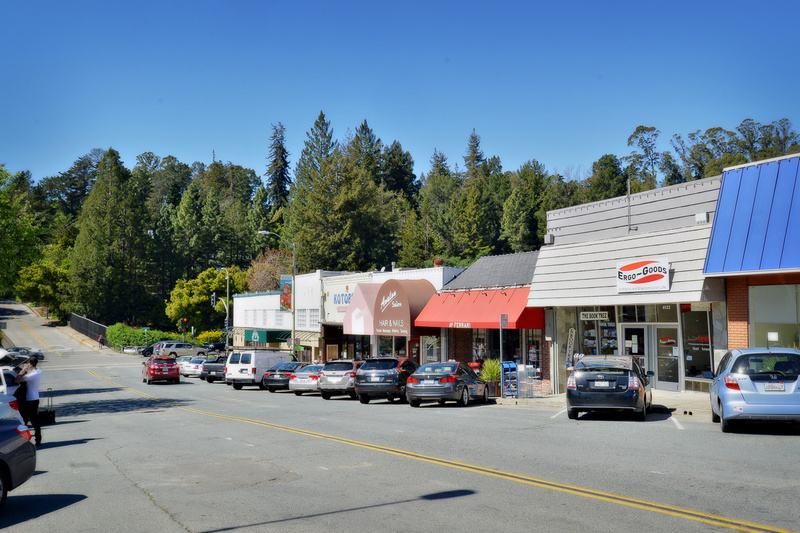 Various public and private corporate buses and casual carpool make the city a short commute. 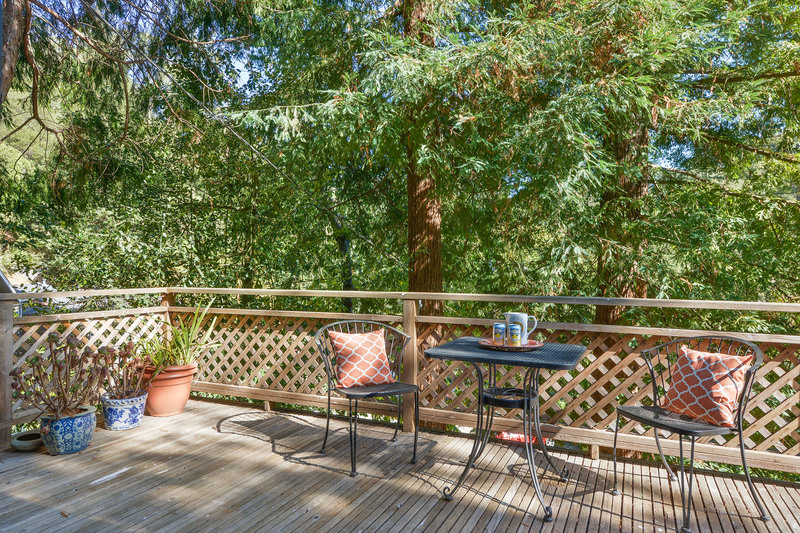 Some decks are in need of TLC but this magical property is WELL worth the effort! 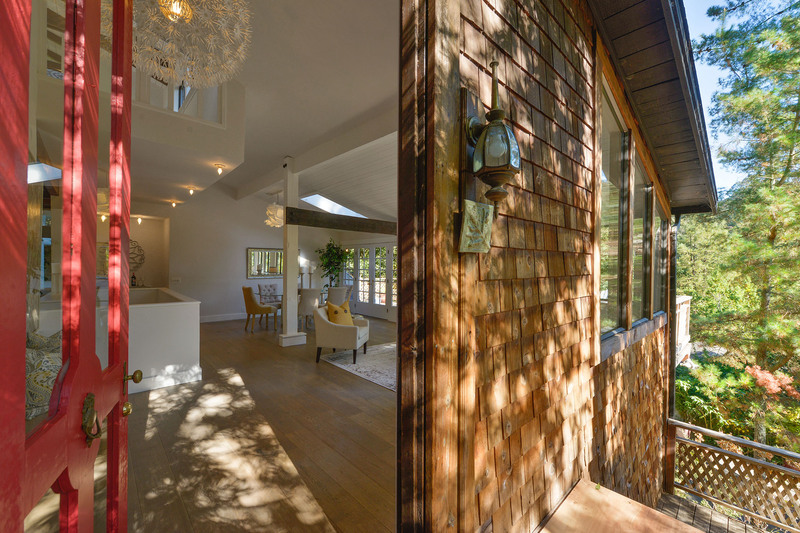 This house is one of a kind. 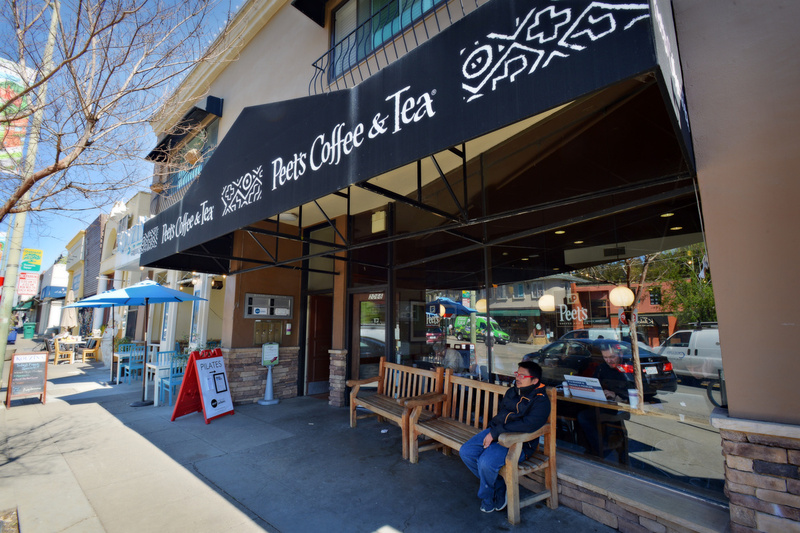 Oakland’s lovely hillside neighborhoods and lively shopping districts draw residents to the East Bay’s largest city - an exciting, vibrant, urban community. 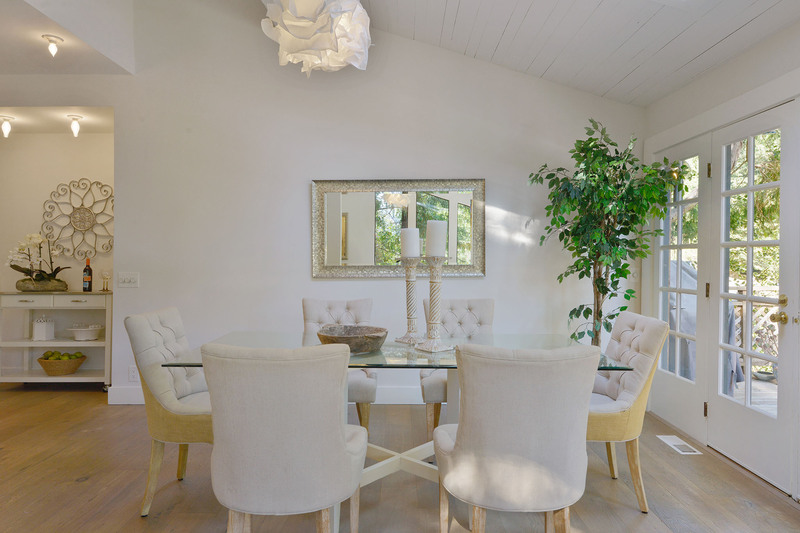 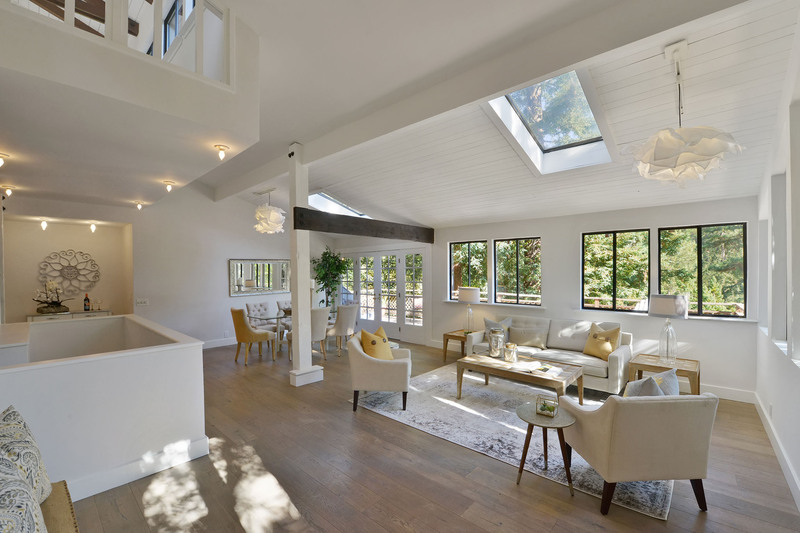 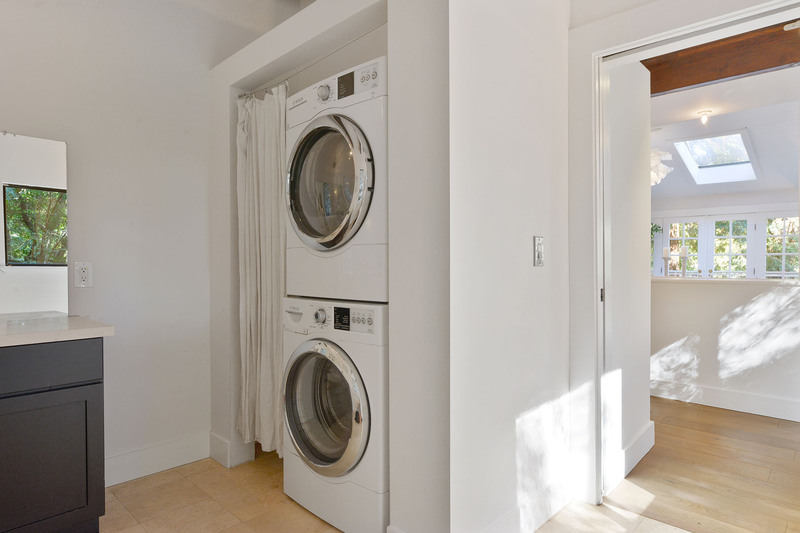 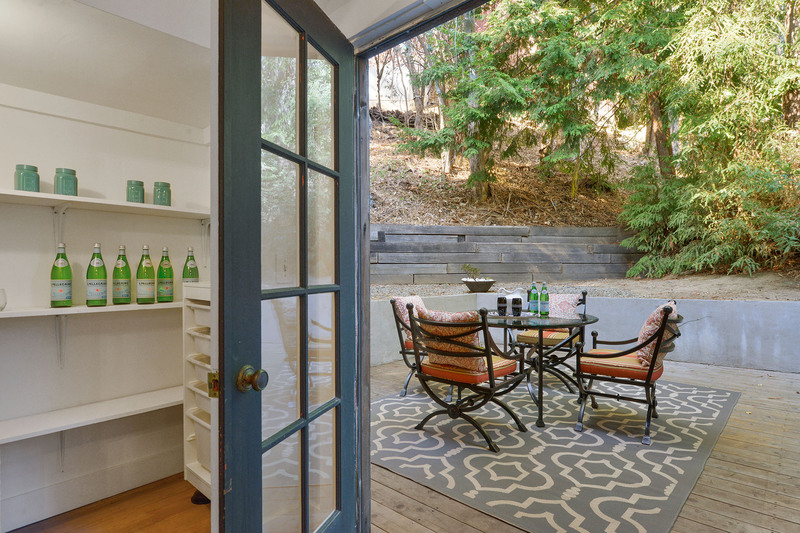 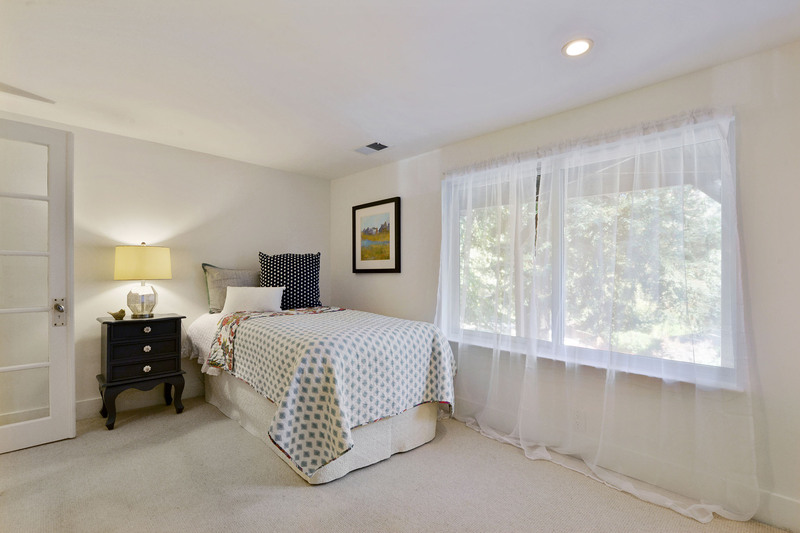 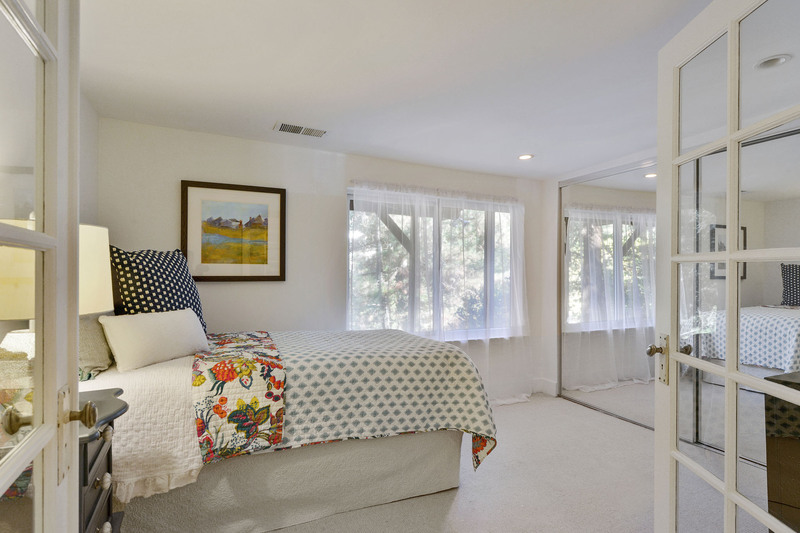 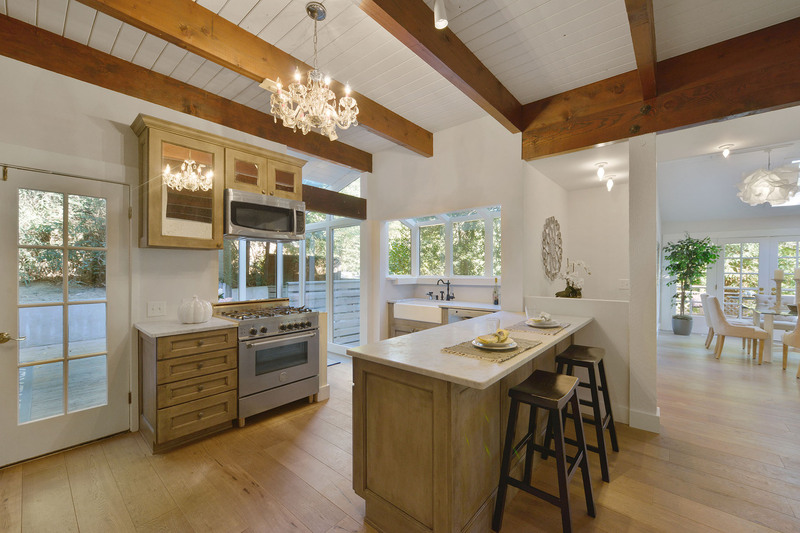 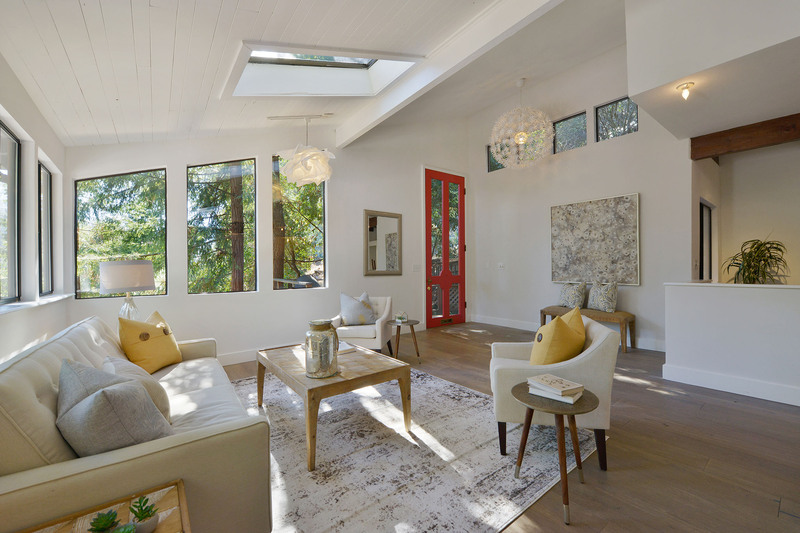 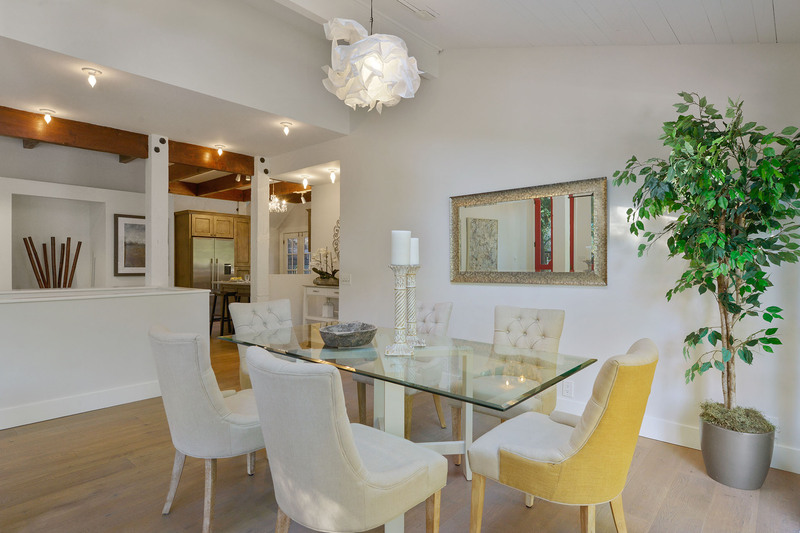 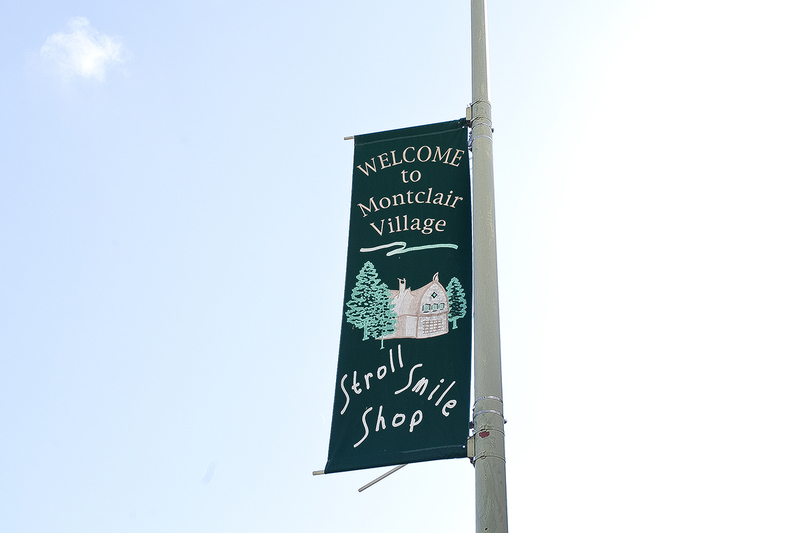 Montclair’s homes are situated on forested lots that offer a quiet retreat from the city. 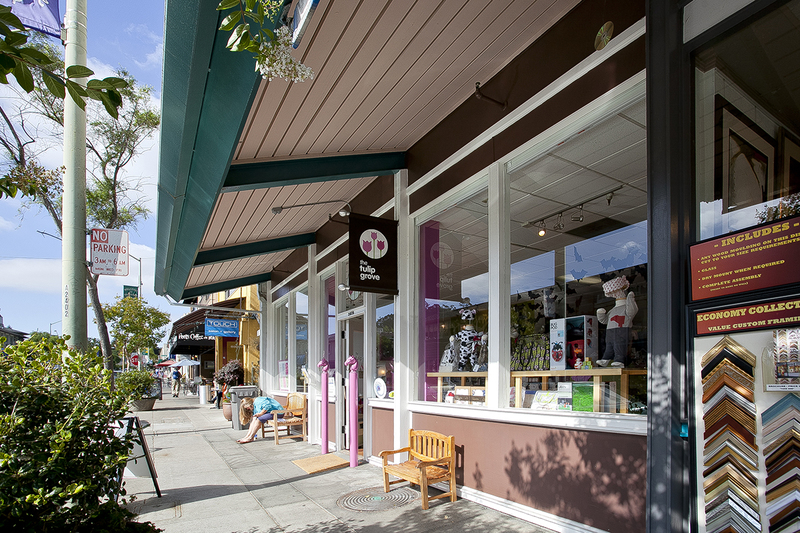 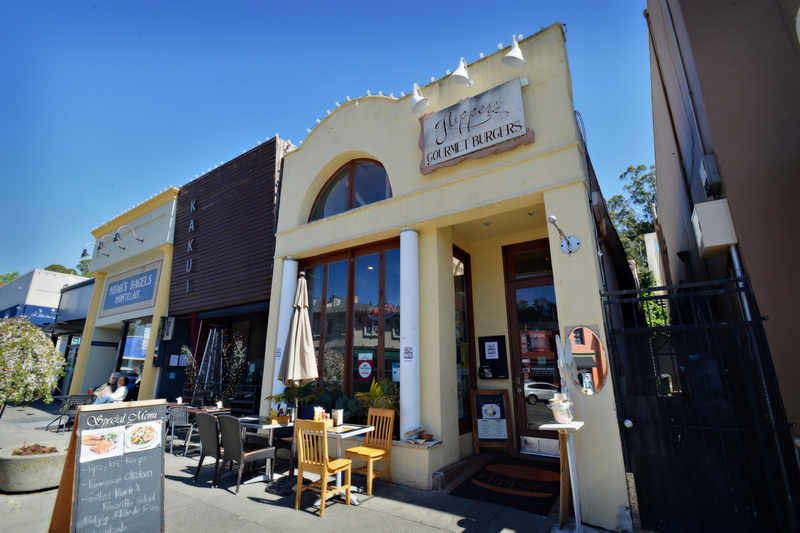 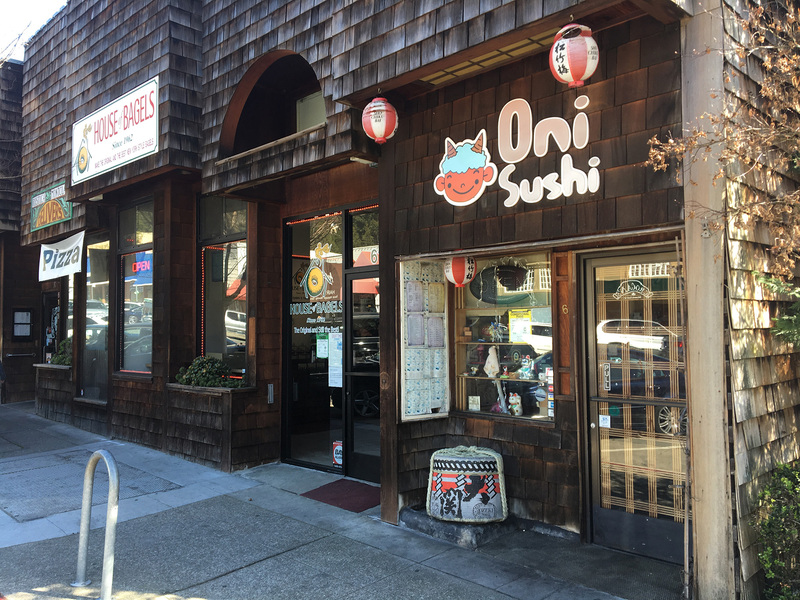 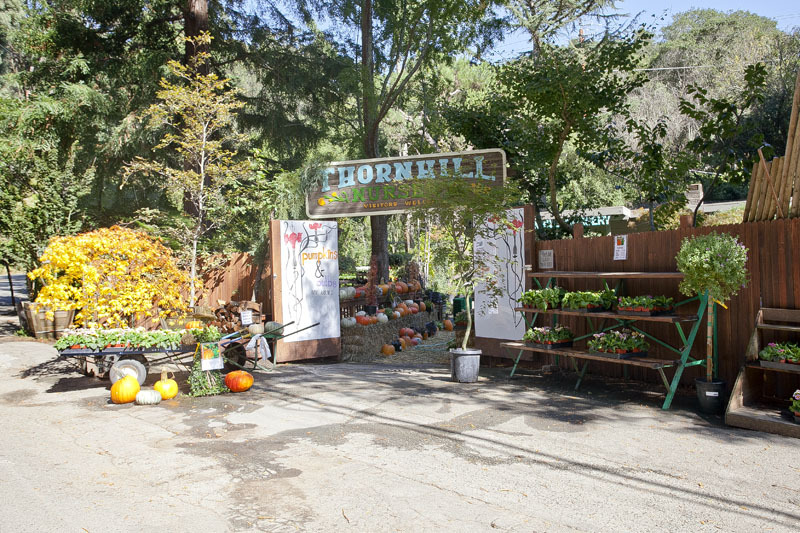 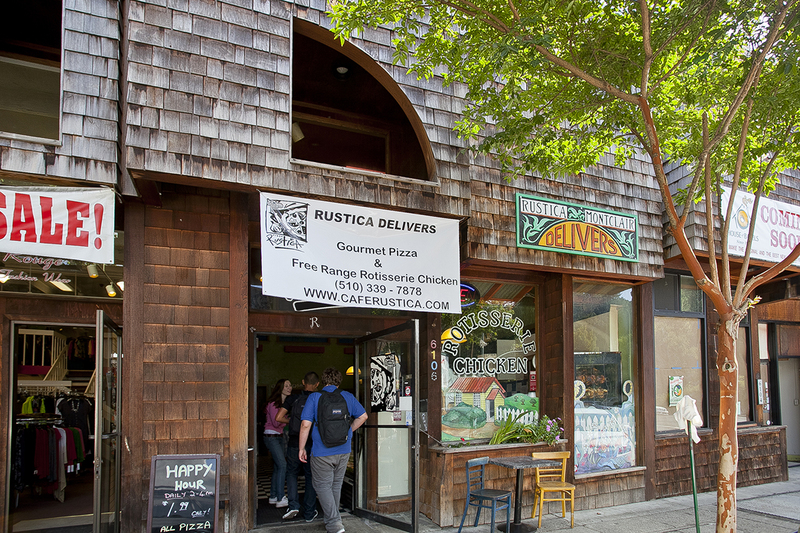 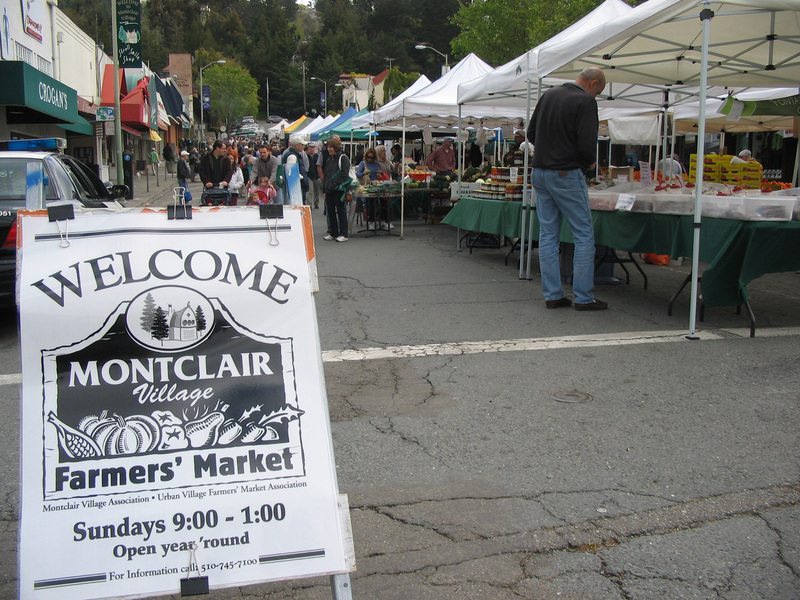 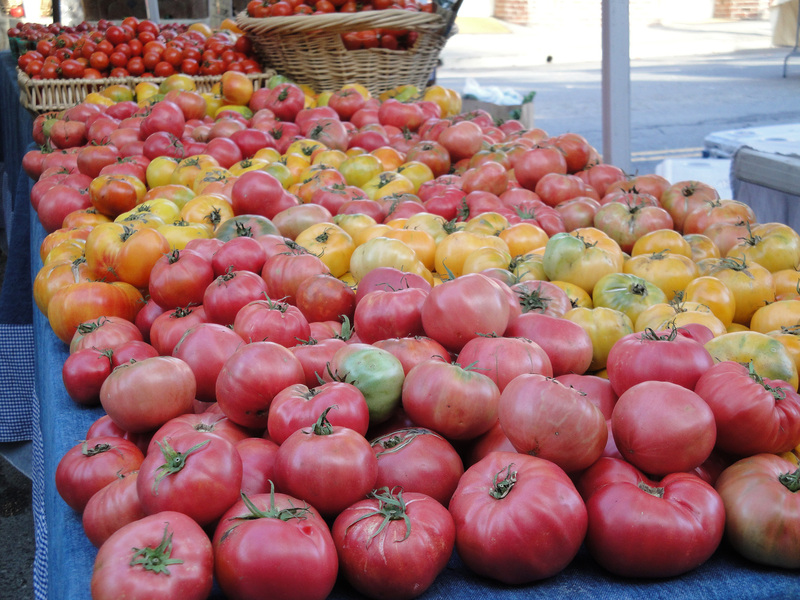 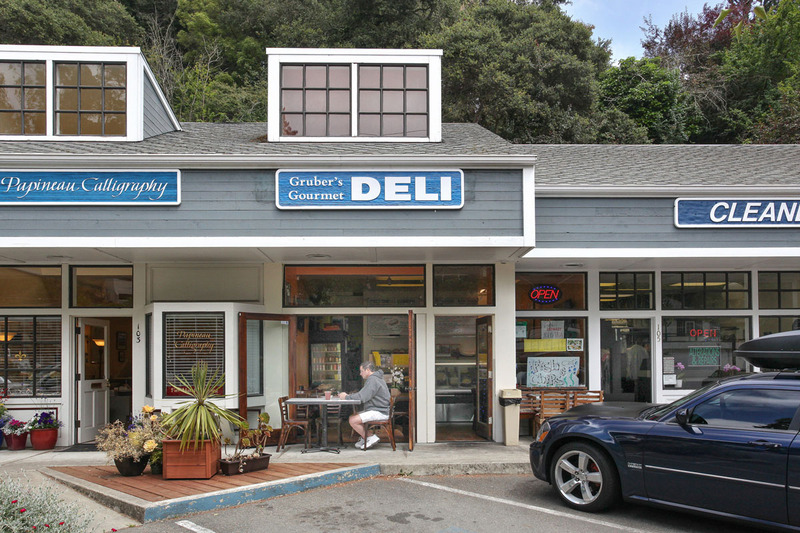 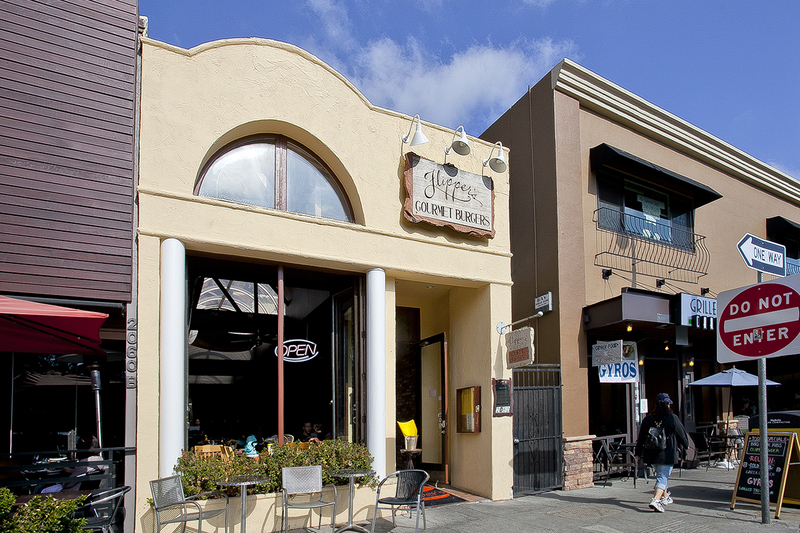 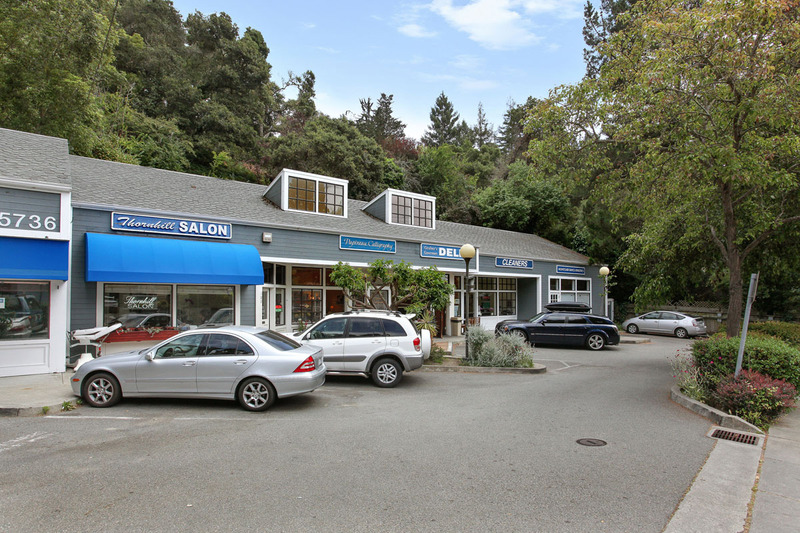 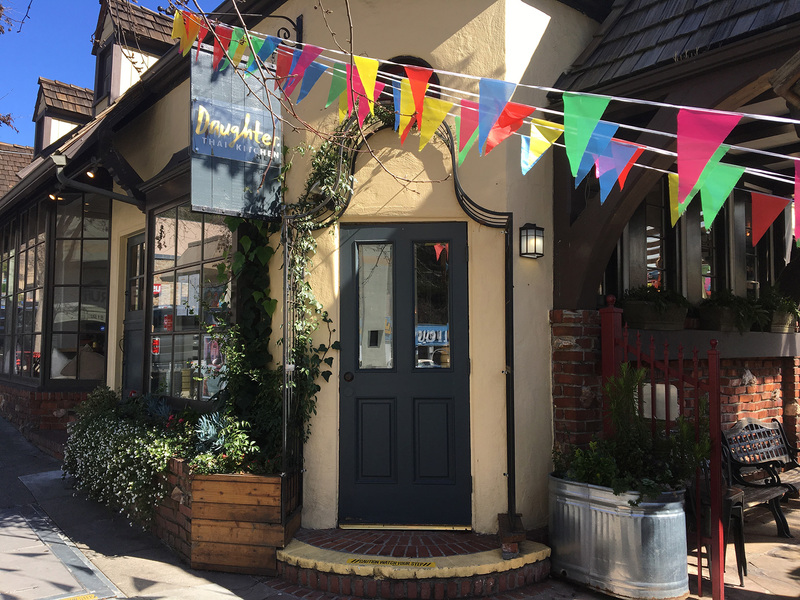 Temescal is an up-and-coming neighborhood along bustling Telegraph Avenue, with the feel of an urban village. 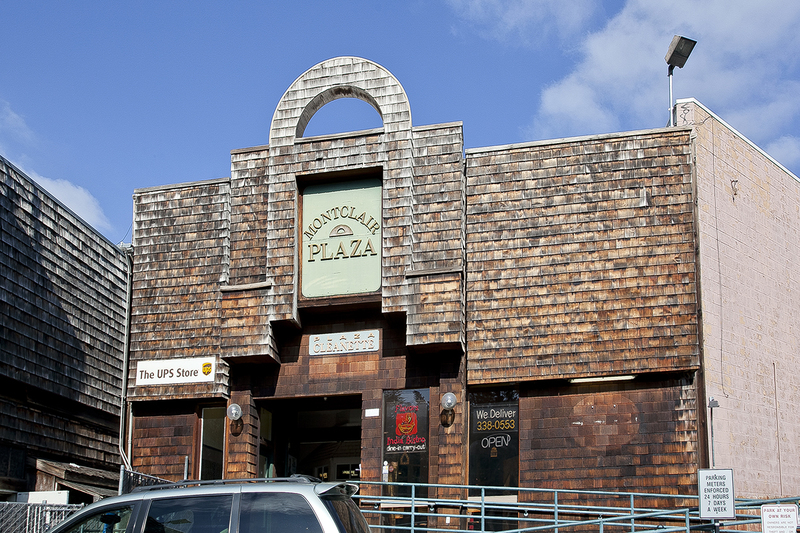 In Jack London Square near the waterfront, old warehouses and former factories have been converted to loft living. 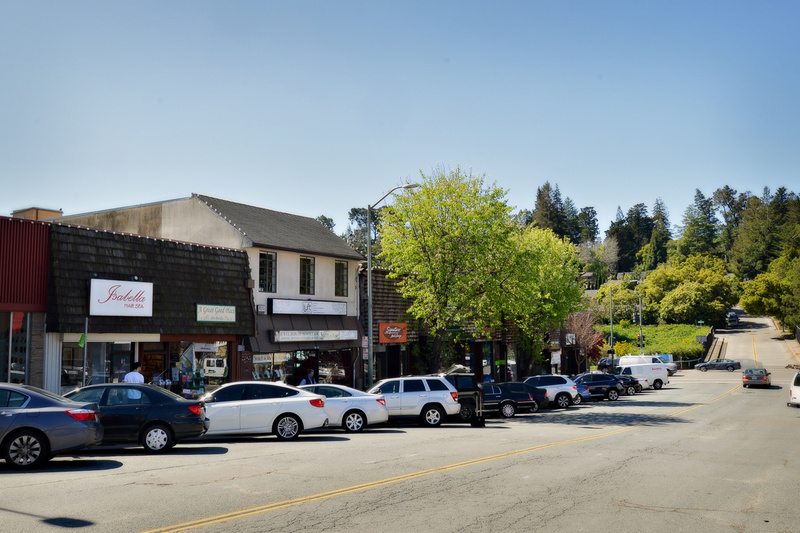 Lakeshore-Upper Grand, with its mix of shopping, restaurants, antique stores, and a farmers market, is one of Oakland’s most eclectic neighborhoods. 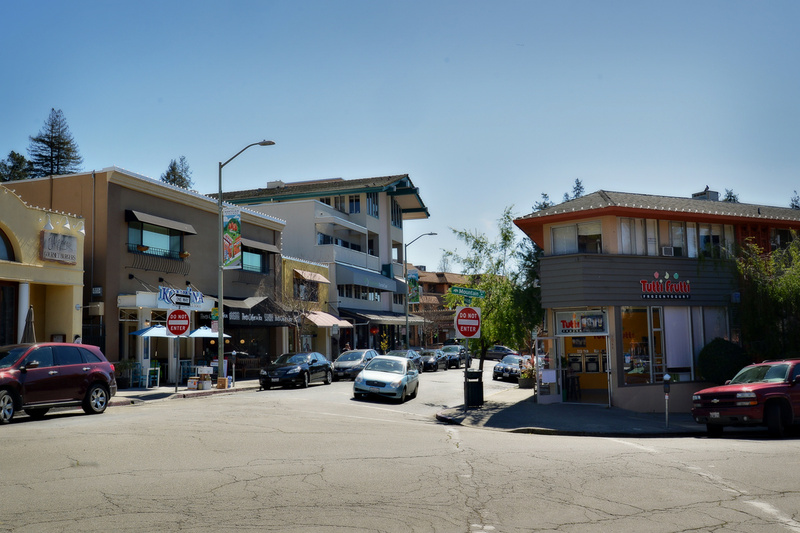 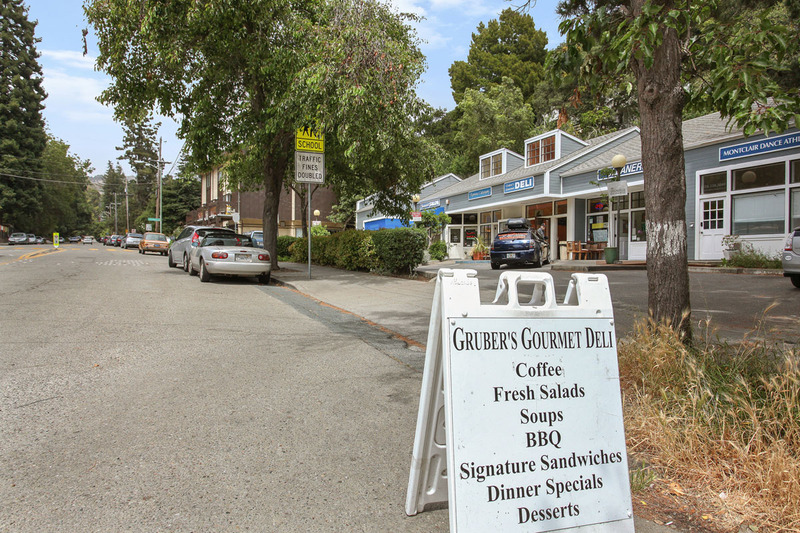 For those who live in Claremont, the Elmwood Shopping District offers a variety of old-fashioned shops and mixture of merchants. 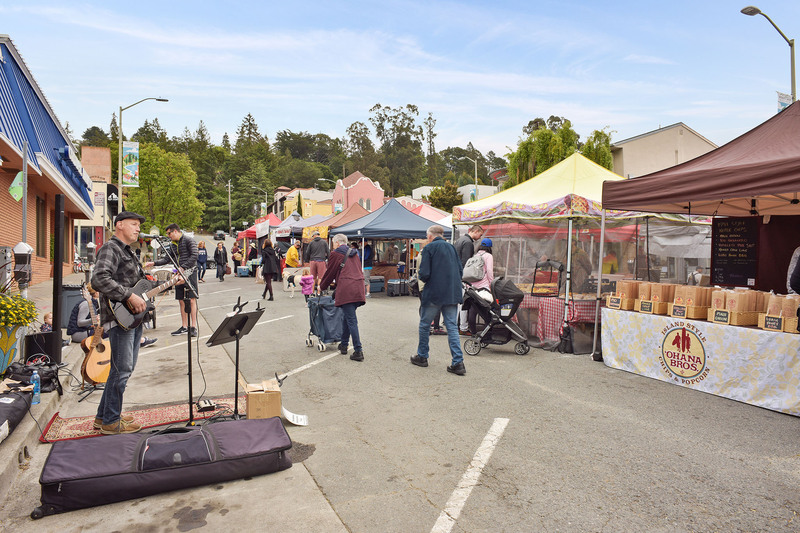 It’s easy to enjoy a wide variety of year-round outdoor activities in Oakland. 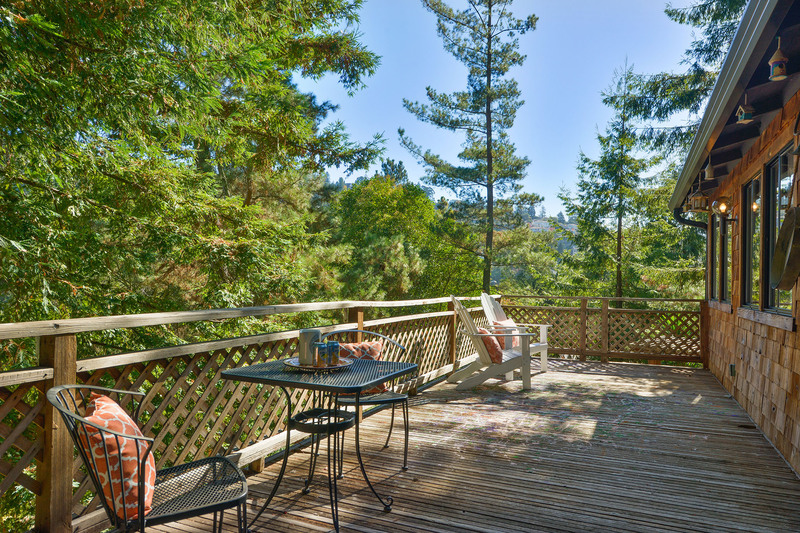 Lake Merritt, located in the heart of the city, offers a 3.4-mile walking path, picnicking, sailing, and kayaking. 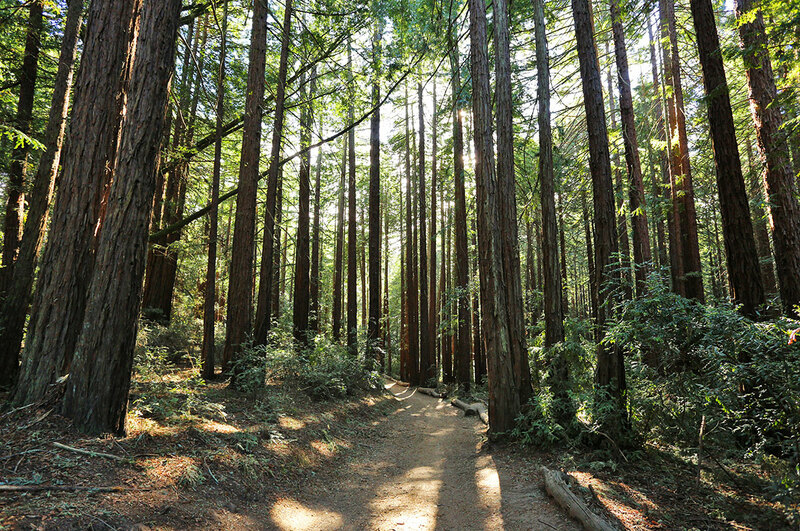 Redwood and Joaquin Regional Parks encompass stately forests of 150-foot coast redwoods and provide miles of hiking, jogging, and horseback-riding trails. 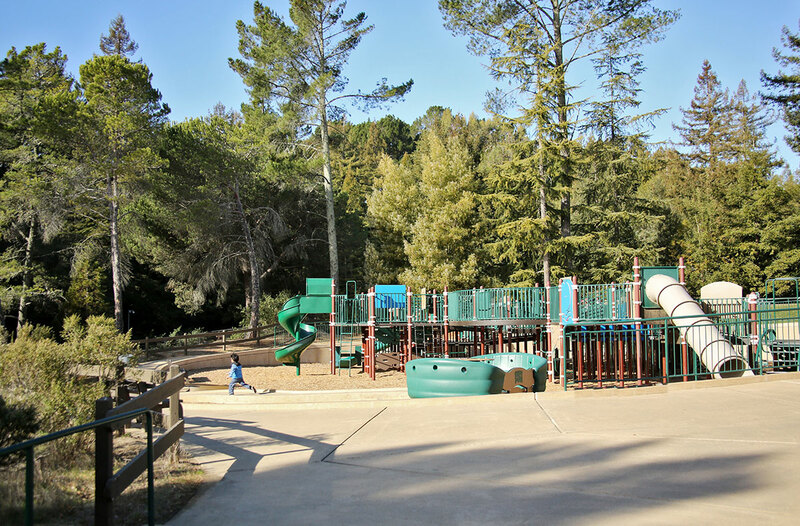 Anthony Chabot Regional Park offers golfing, an equestrian center, hiking, bicycling, and fishing. 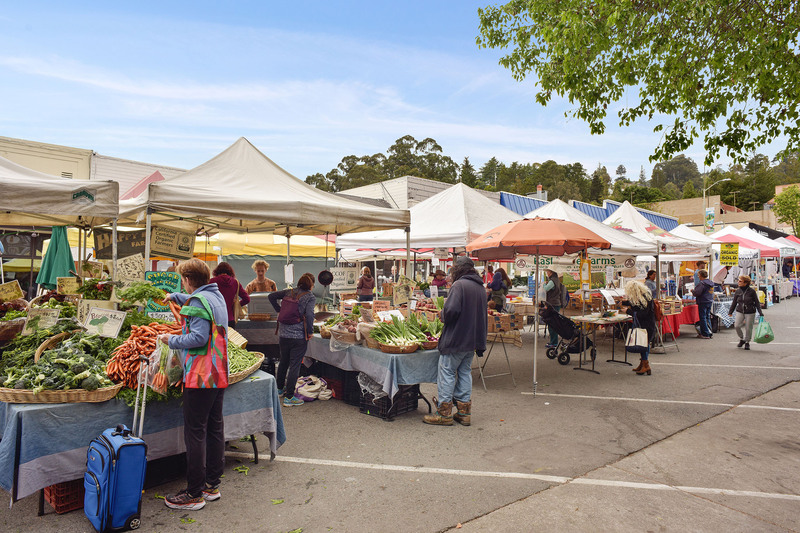 For sports fans, Oakland is home to the Oakland Raiders, Oakland Athletics, Golden State Warriors, and the Golden Gate Fields racetrack Oakland residents have plenty of public transportation options, including Bay Area Rapid Transit (BART), buses, ferries, and casual carpools. 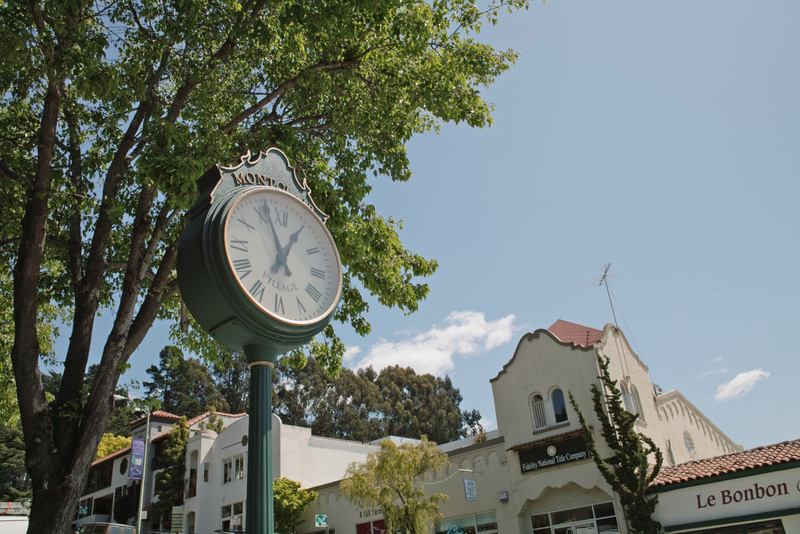 Oakland International Airport is serviced by more than 10 major airlines.